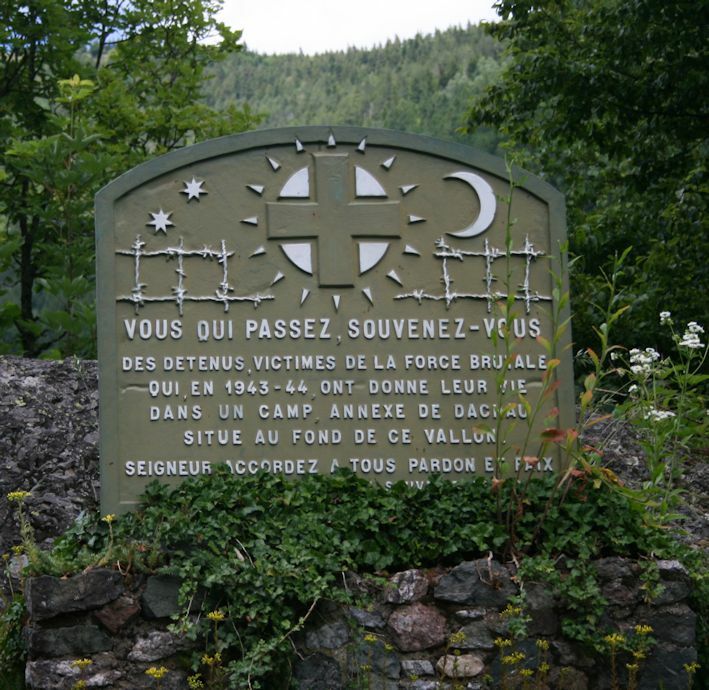 The Tour de France in the Vosges and Alsace passes some of the most historically interesting parts of the area, places significant in the period before the Great War when Alsace and Lorraine were under German occupation and sites of sadness and commemoration afterwards. 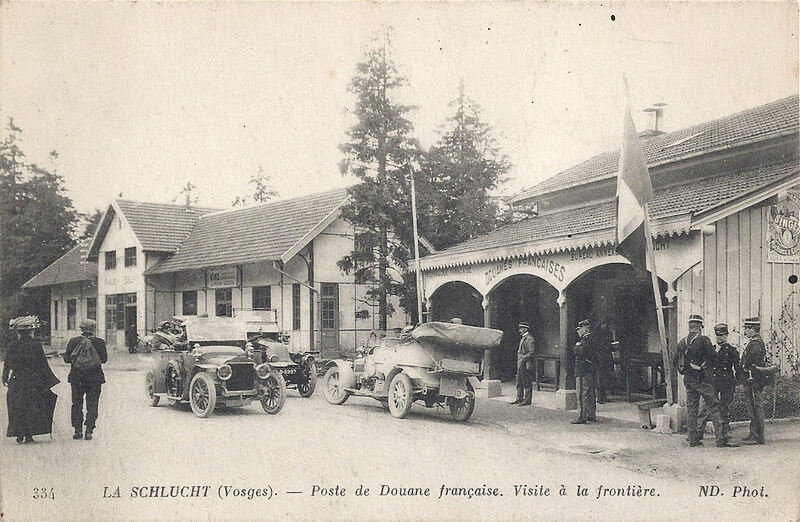 Postcard writers, travellers, tourists and soldiers, sent innumerable cards home from the Vosges. This is a small selection from my own collection, following the route of the Tour in two parts, Stage 9 and Stage 10. 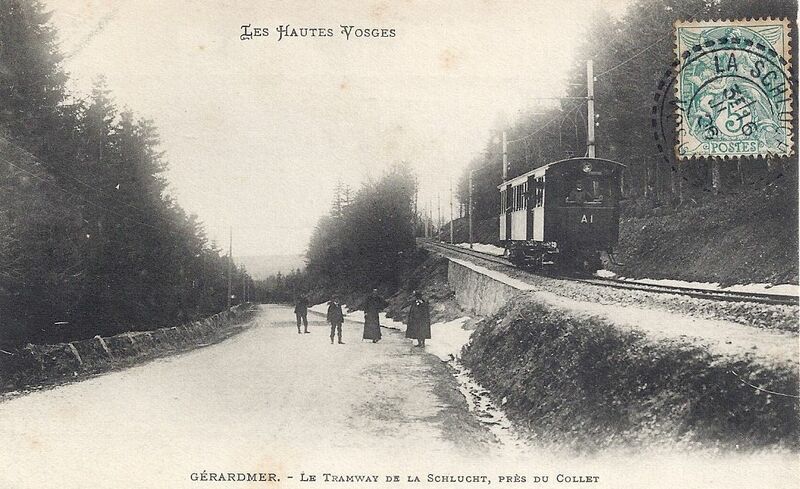 The tramway from Gérardmer up to Col de la Schlucht, close to le Collet. 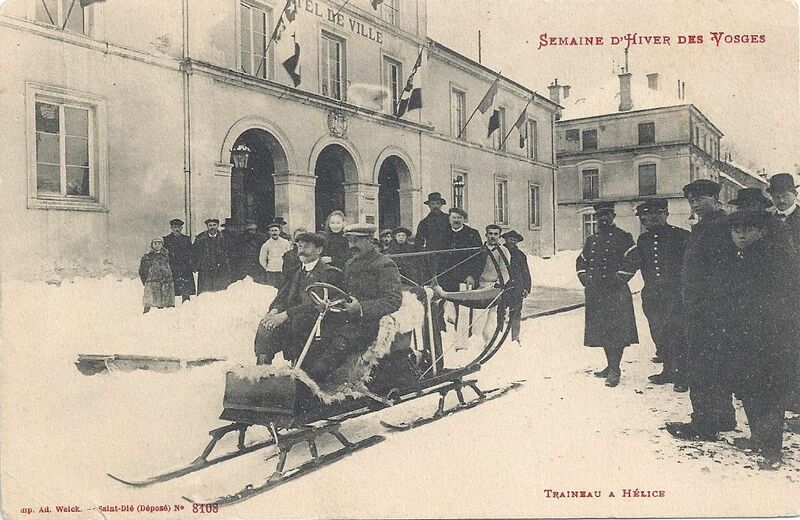 The tram line was used for military transport during the Great War. The embankments and the path of the tramway can still be seen. Col de la Schlucht (1140 m) This was a busy destination on the frontier between France and Alsace (annexed to Germany, 1871). 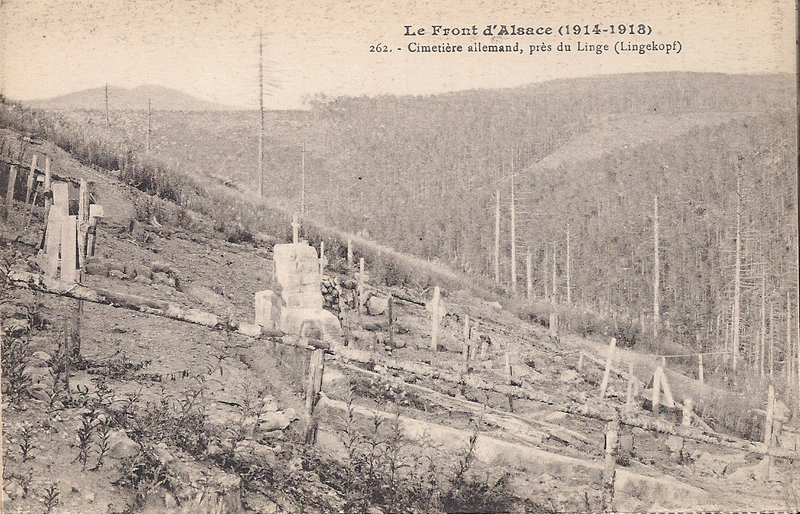 The original bornes frontières (boundary stones) can still be traced following the frontier up the hillside, marked with F on the French side and D on the German. 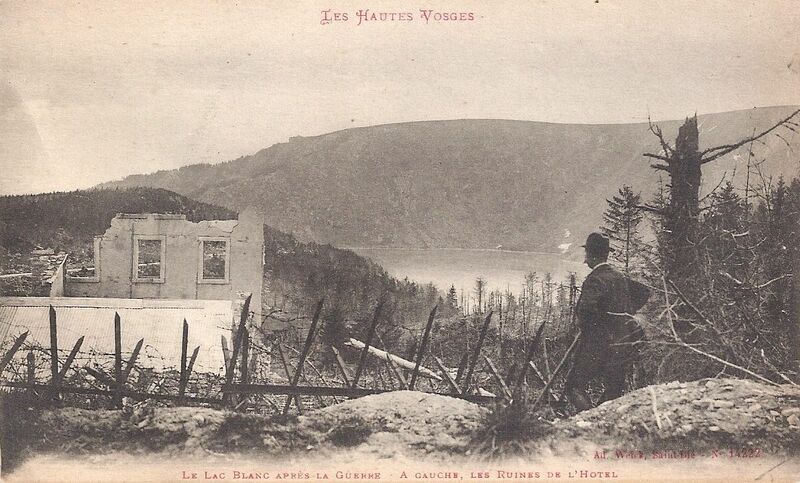 Basses-Huttes – the Tour does not visit Lac Noir, but goes close. 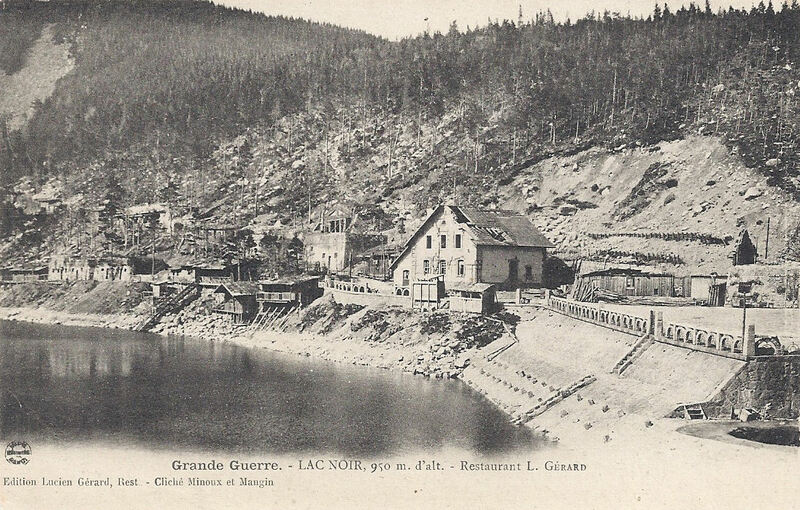 Lac Noir was a peaceful destination with a popular restaurant. 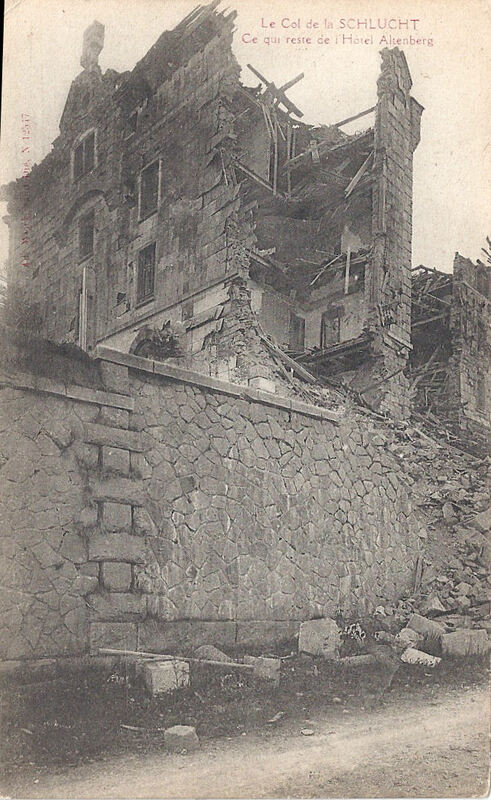 During the Great War, it was used as a place of shelter: Gen Pouydraguin had his headquarters here. The small single storey buildings to the left of the lower picture were used as a hospital. They have recently been demolished. The restaurant was rebuilt and remains busy. 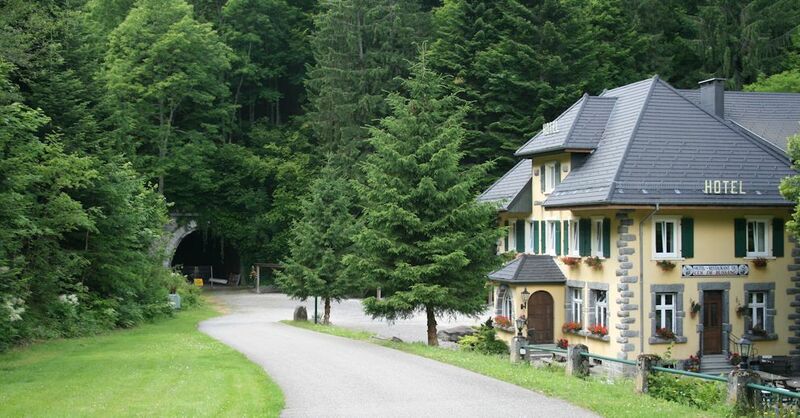 Col du Wettstein (880m) The Tour enters one of its most sobering stages. 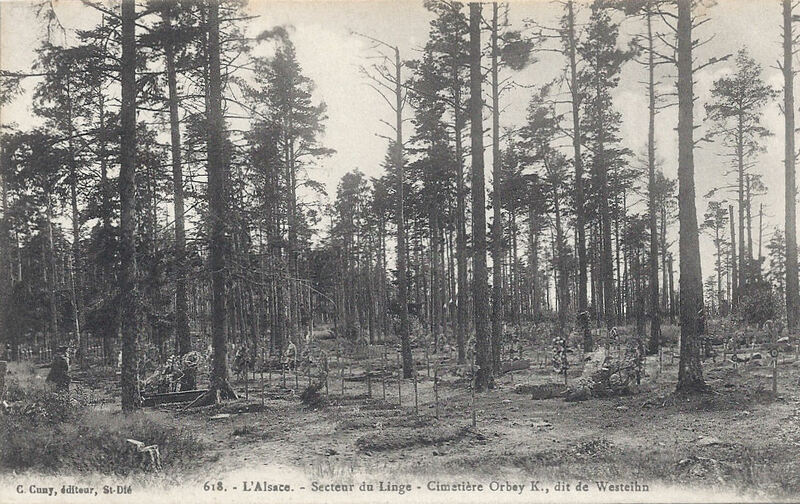 17000 men, including 10000 Chasseurs, died at le Linge between July 20th and October 15th, 1915. 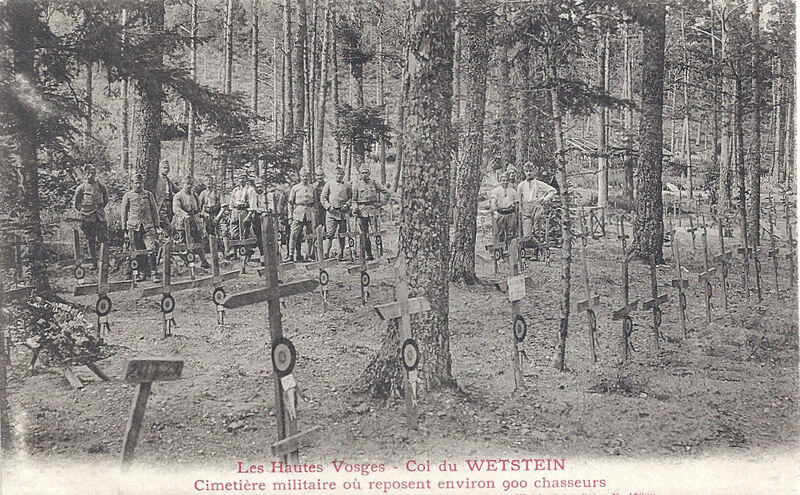 The French dead of le Linge, Schratzmännele and Barrenkopf lie in the great cemetery at the Col du Wettstein. 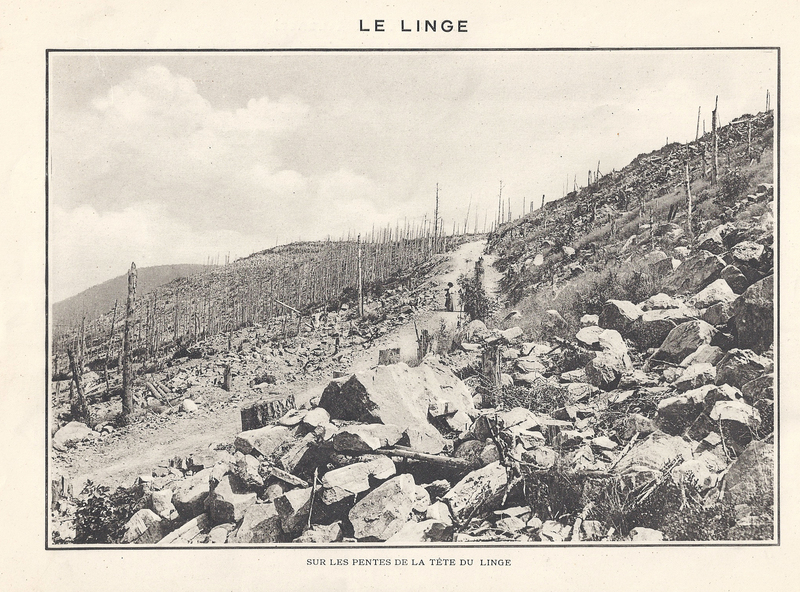 A selection of images showing le Linge during and after the Great War. It was, obviously, a place of pilgrimage and reflection for those who had lost loved ones or friends there, or who had experienced the hell themselves. 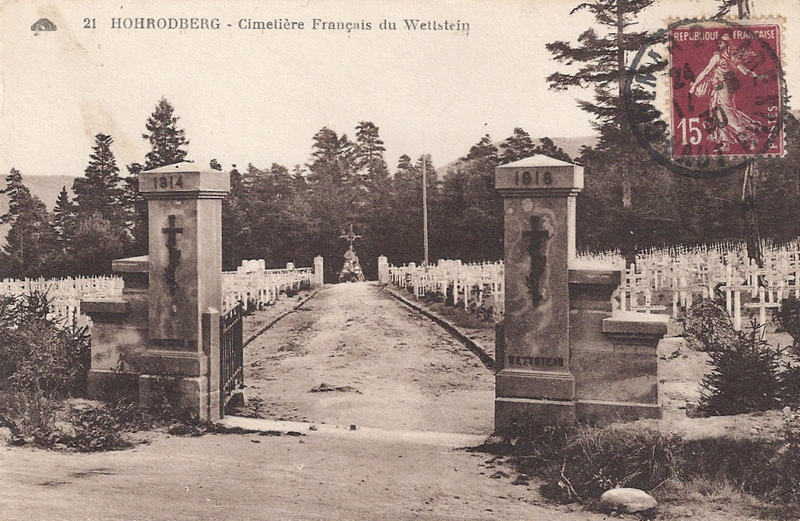 The German dead are buried in their military cemetery, Hohrod. 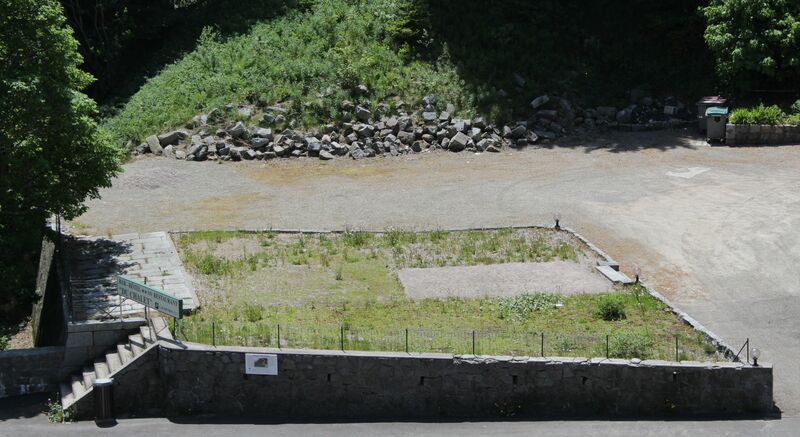 The bunker outside the walls is still there, adjacent to the road. 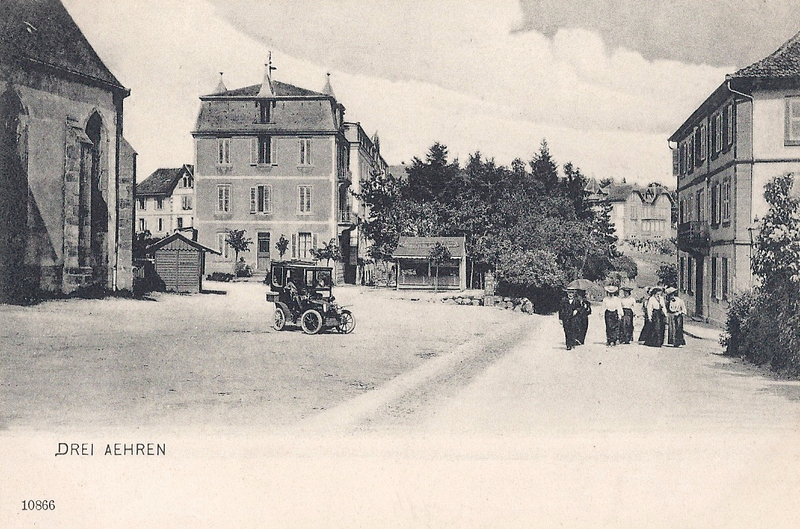 The town before the Great War while under German occupation, labelled with its German name Drei Ähren. 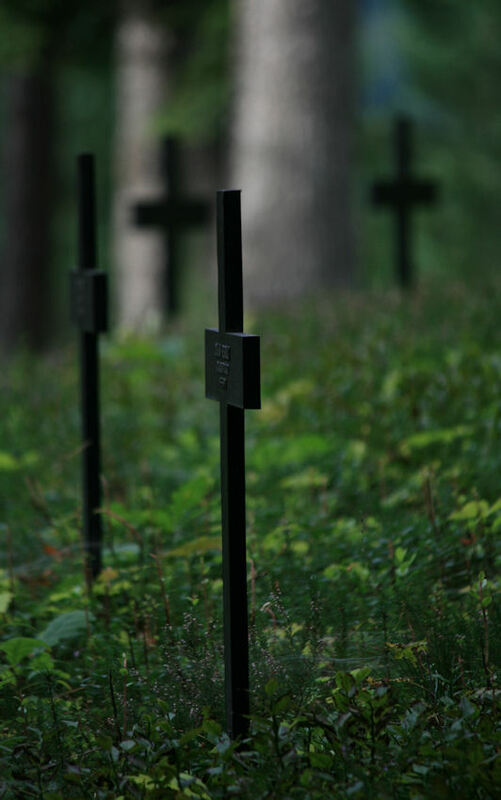 There is now a rather special German military cemetery in the town. 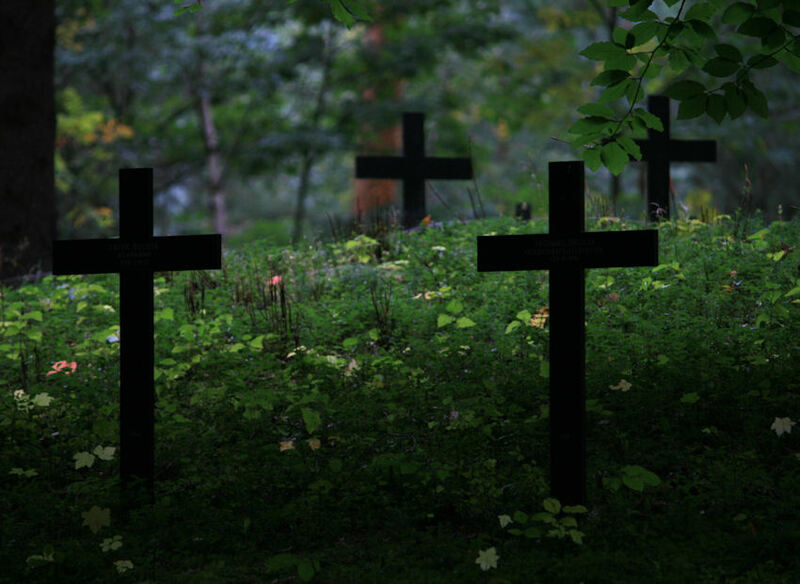 Its headstones have been replaced with modern crosses and wild flowers dominate the grounds. 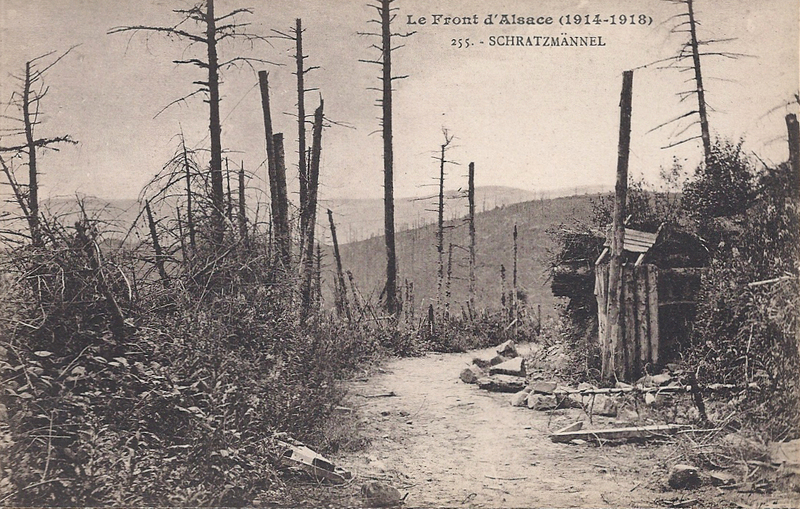 Le Markstein (1183 m) – vestiges of the Great War can easily be seen from the Route des Crêtes, established by Joffre for the efficient movement of troops and supplies. 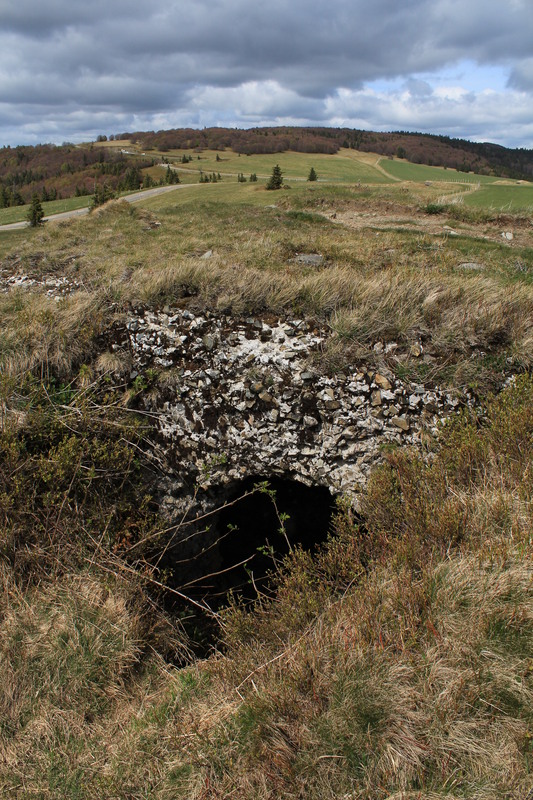 My photo shows how close these vestiges are to the Route des Crêtes (they are best seen in spring before the vegetation has grown back). 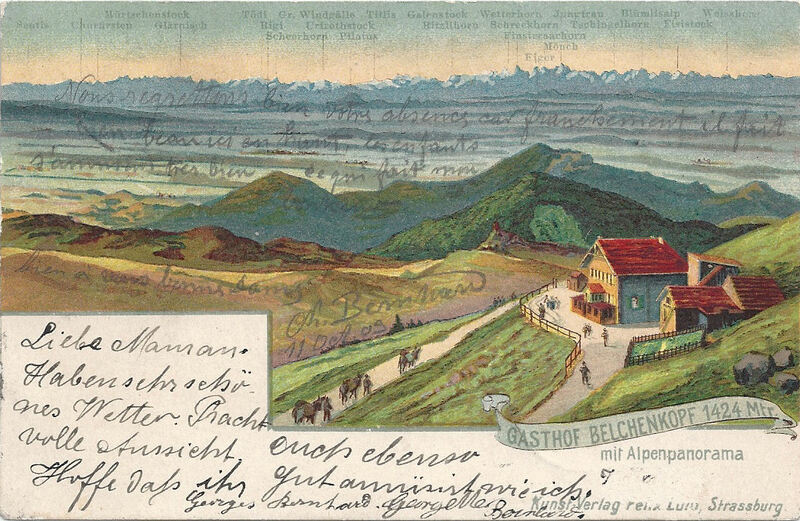 Postcard posted 1903 written in both German (the language of Alsace in occupation) and French, which was discouraged. 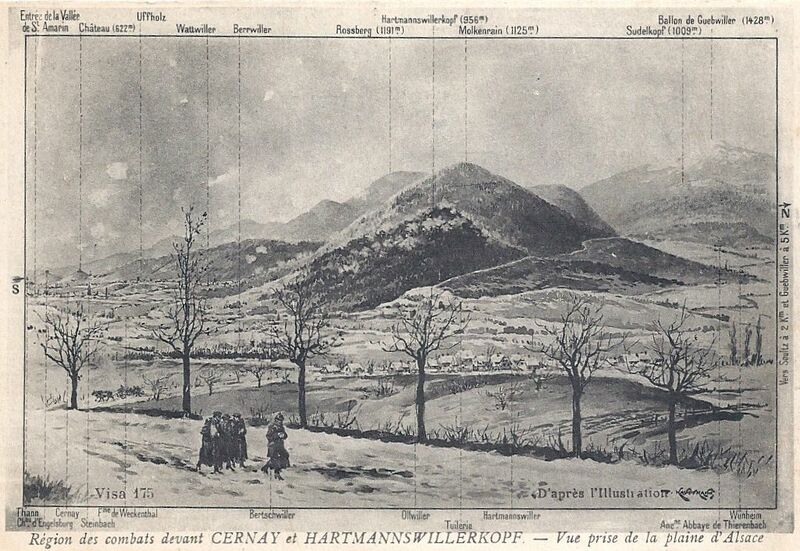 This is the area of Hartmannswillerkopf / le Vieil Armand, the strategically vital mountain which gave views over and control of the Rhine Valley, bitterly fought over in 1915. Please explore the index of my blog for more pieces about this lovely region before the Great War! All postcards and photographs are my own. 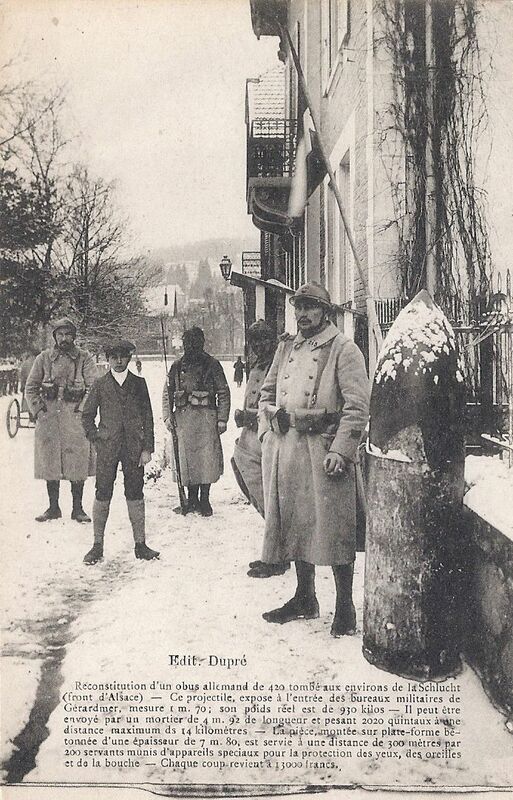 Categories: Alsace at War - 1914-1918, Environs: countryside, Life and leisure, Towns and villages, Vosges | Tags: Alsace, Col de la Schlucht, First World War, frontière, frontier, Great War, hiver Vosges, Hotel Altenberg, Reichsland Elsaß Lothringen, Tour de France 2014, Vosges | Permalink. 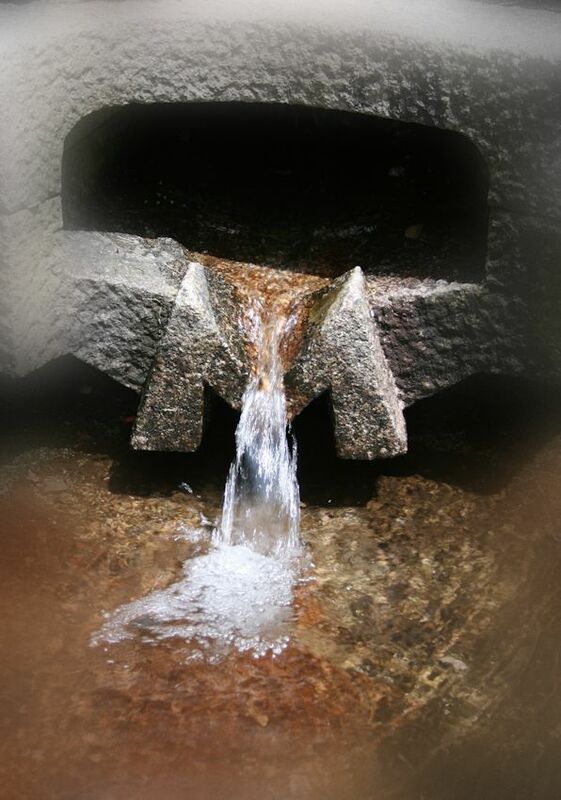 … or indicate the name of the river. 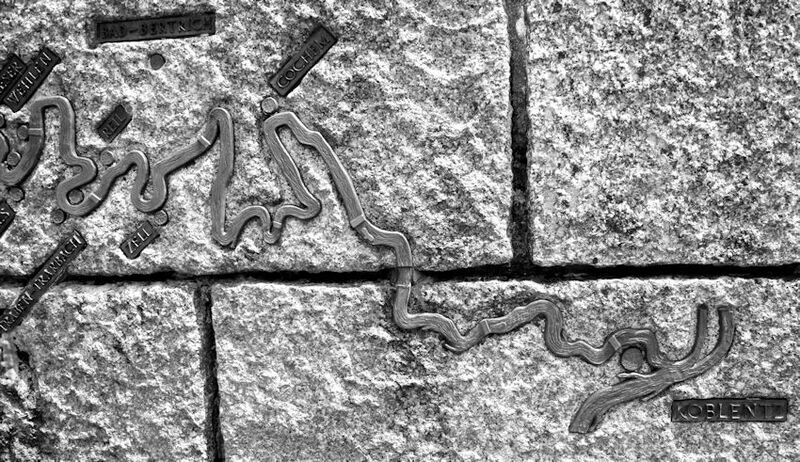 An elegant design set into the adjacent wall informs you that this is the source of the Moselle at 715 m and a map traces the route through France and Germany (where it becomes the Mosel) to Koblenz, where it flows grandly into the Rhine, 550 km from its insignificant source. 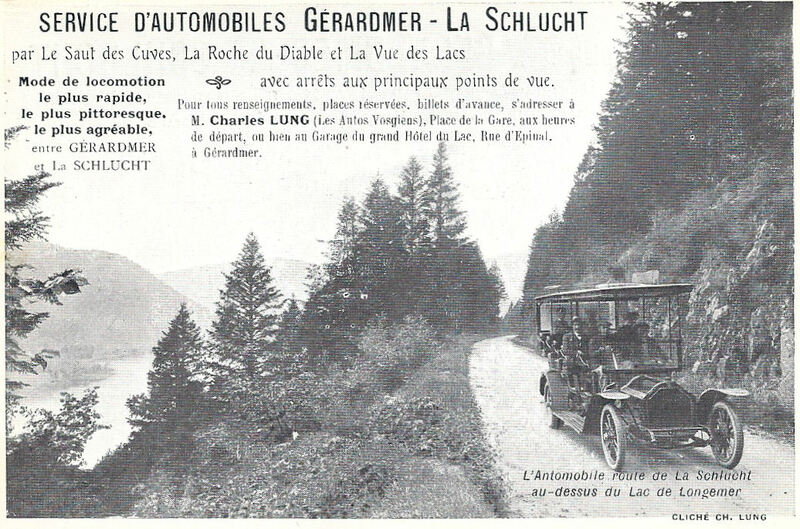 Now the main road N66 races through the Col, taking heavy traffic through the Vosges between Thann and Remiremont on dual carriageways and viaducts. 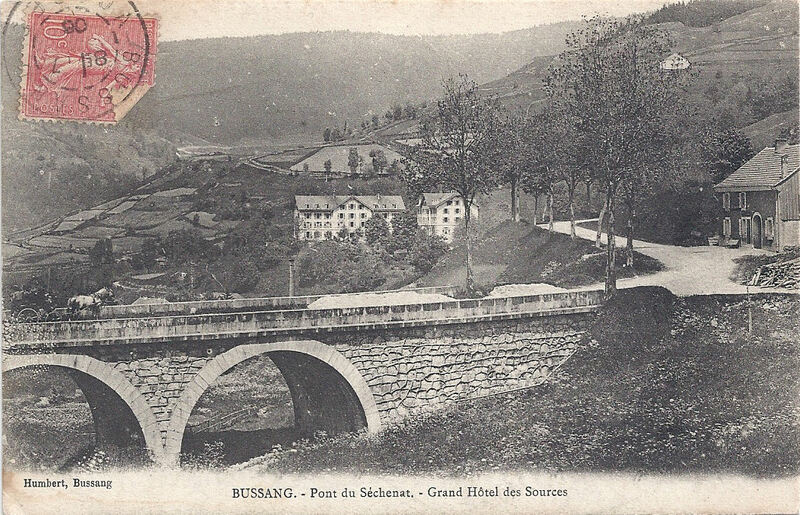 About a kilometre onwards from the Col, a traveller in the time of Reichsland Elsaß-Lothringen would be able to see the bridge over le Séchenat, a tributary of the Moselle. 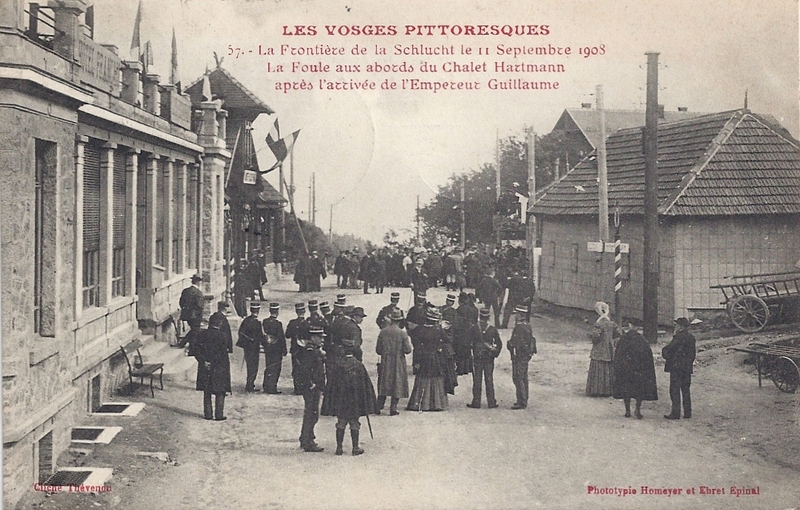 In these two postcards, horse-drawn traffic is warily crossing the Pont du Séchenat. 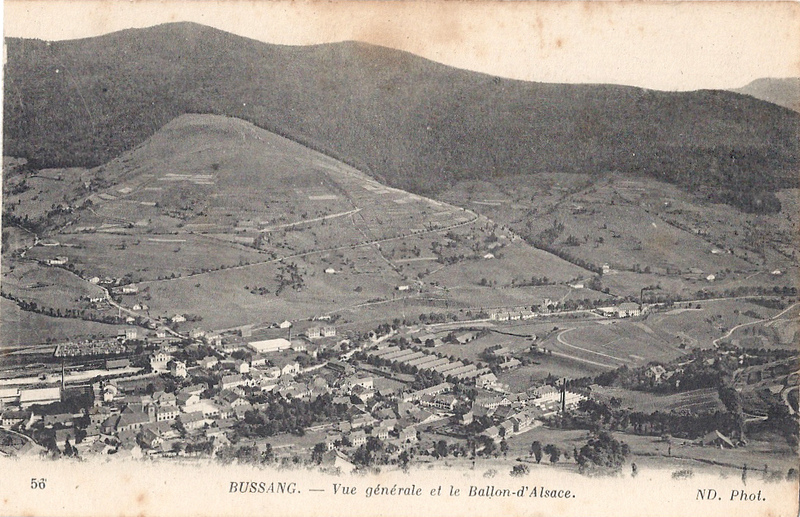 In three kilometres or so the road down from the Col flattens out into the valley of Bussang, distantly overlooked by the Ballon d’Alsace* to the south. It then heads on west, under the shadow of the Ballon de Servance. 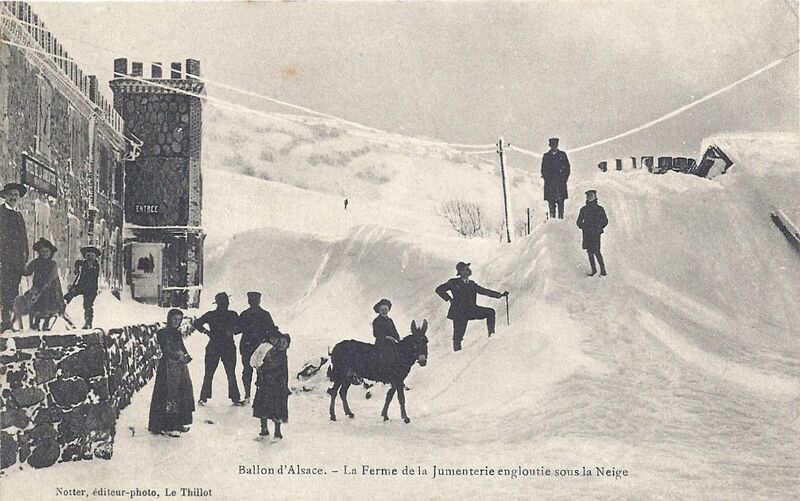 Looking at the bitter winter climate even lower down from the heights, it’s unsurprising that the military personnel stationed on the Ballon du Servance needed protective clothing. All photographs and postcards are my own. 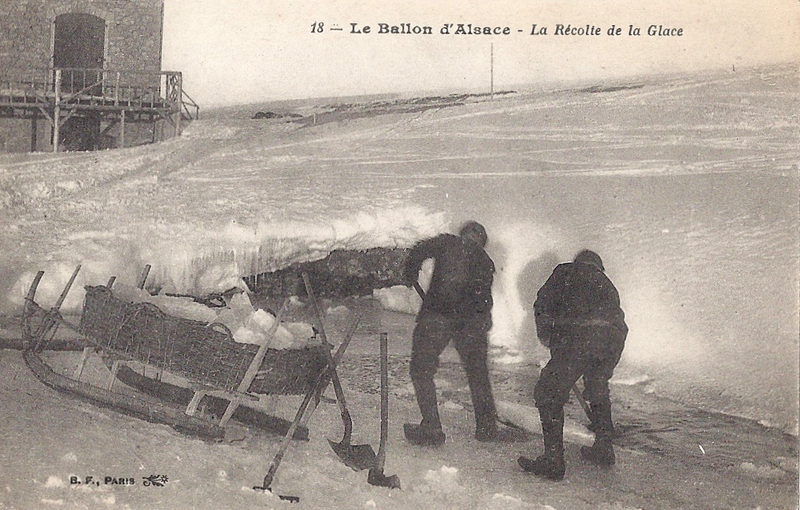 *Please see other blog posts to read more about the Ballon d’Alsace. 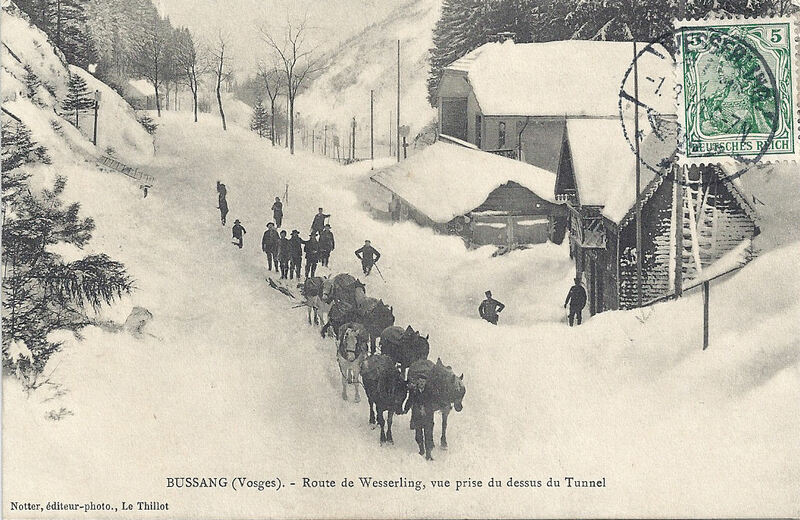 Categories: Environs: countryside, towns and villages, The frontier, The Vosges Cols, Vosges | Tags: Alsace, Col de Bussang, hiver Vosges, Moselle, Vosges, winter Vosges | Permalink. 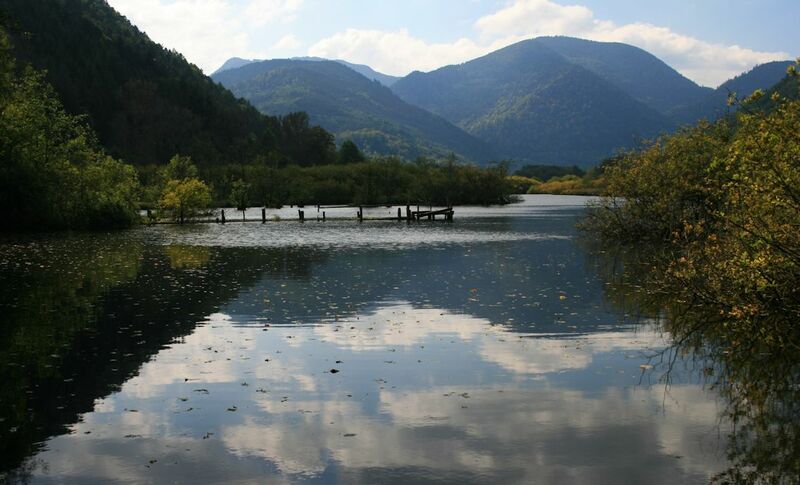 The main road between Thann and Remiremont passes the tranquil, natural lake of the See d’Urbès, where you can walk round the water’s edge and watch dragonflies darting among the marshes. 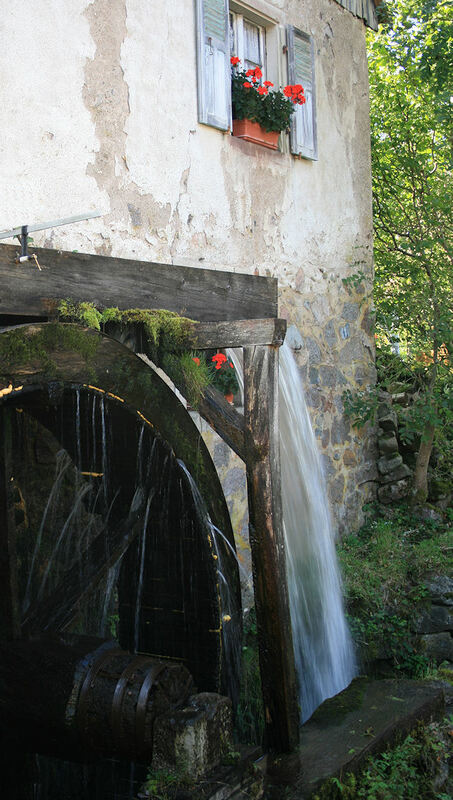 You can take the little road to peaceful Storckensohn, walk past the pretty Alsacien houses and pause by the old oil mill, a watermill. I imagine that visitors from a century ago would have seen a similar scene. 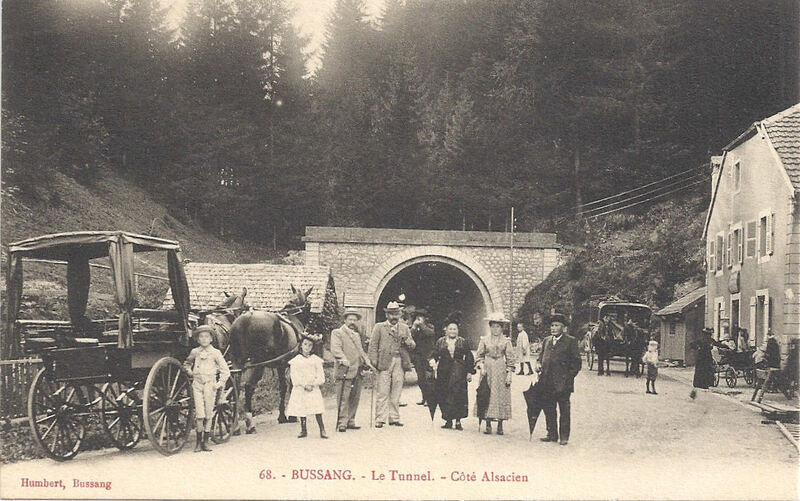 The N66 is a fast, winding road and I imagine that many drivers keen to finish the steep climb to the Col du Bussang (731m) are completely unaware that just to the north of the summit (the col) there is a tunnel through the hillside. 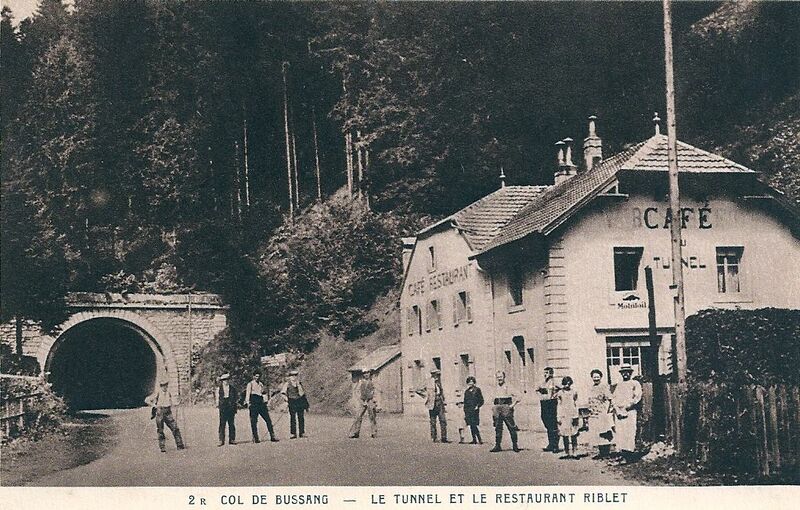 It replaced an important road which passed above the site where the tunnel was constructed. The sign over the French entrance to the tunnel was specific: Limite de territoire français 155m de l’origine de tunnel. 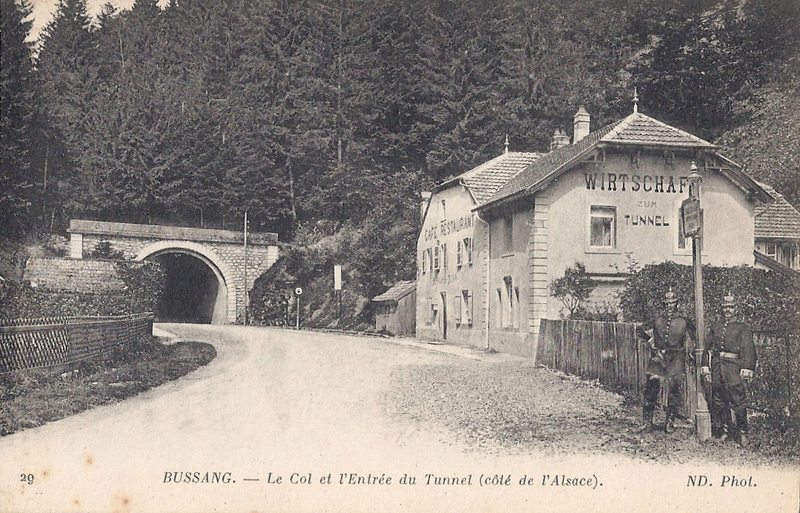 Shortly after entering the tunnel, the traveller was entering German territory. 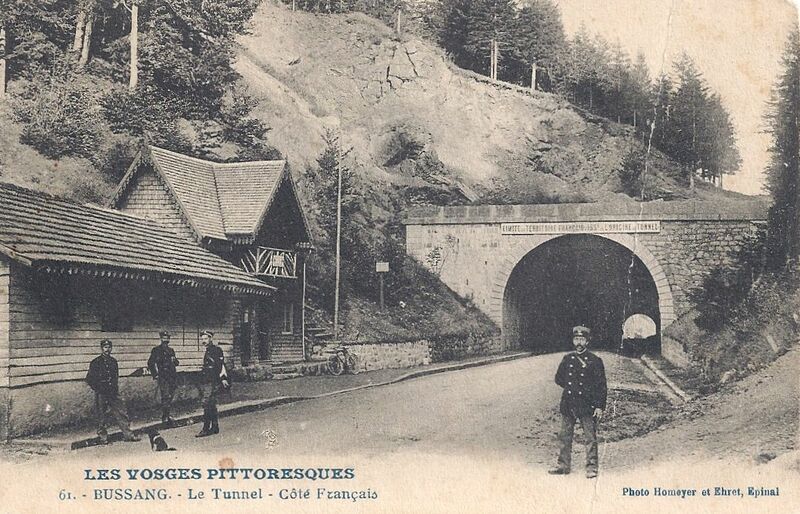 Customs and security on the other side of the tunnel were markedly different from that on the French side, in the officials’ uniforms and the language. 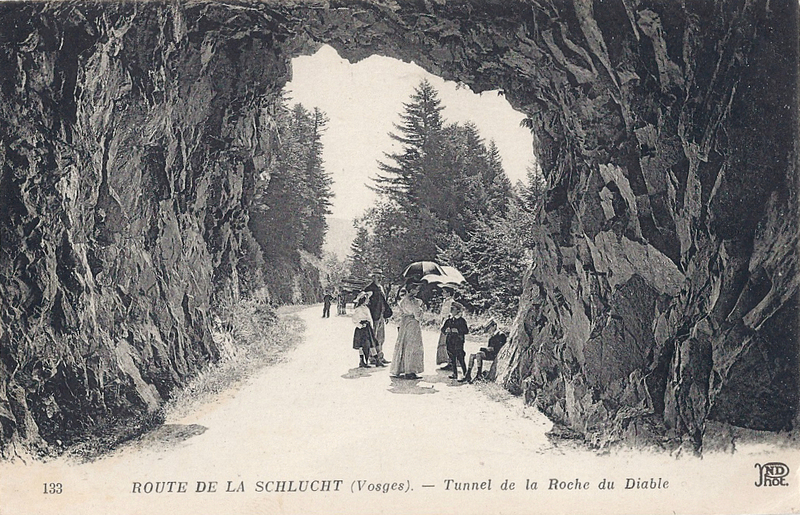 The tunnel was a great draw for tourists and travellers. 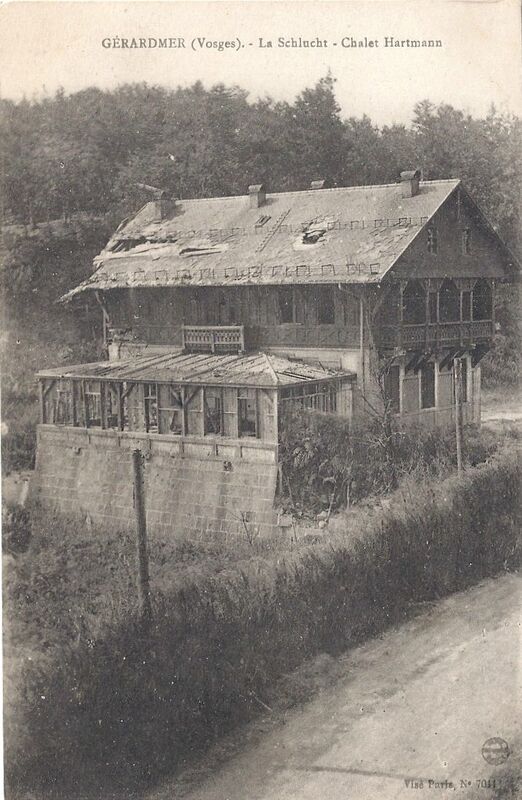 The café was, I believe, Café Murat and postcards dated after the Great War show that ‘Wirtschaft zum Tunnel’ was promptly obliterated and replaced with ‘Café du tunnel’. 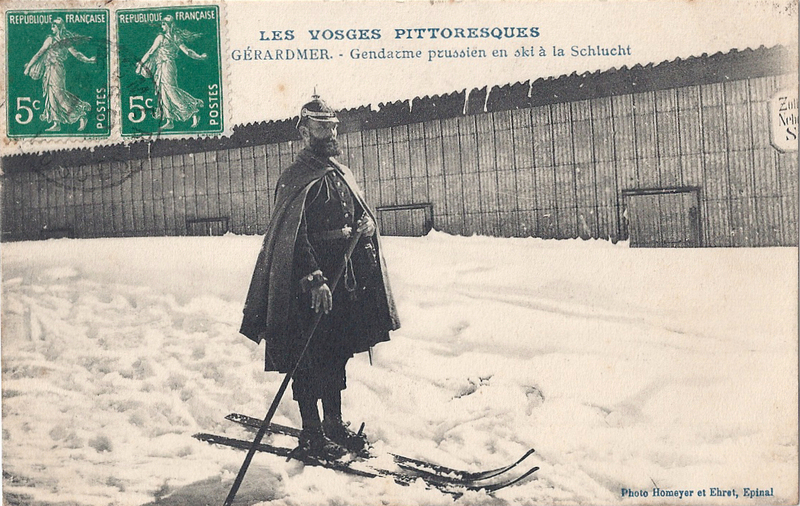 These two cards demonstrate the difficulties of travelling through the Vosges in winter. Both show the French side of the frontier and the customs officials are visible in each. 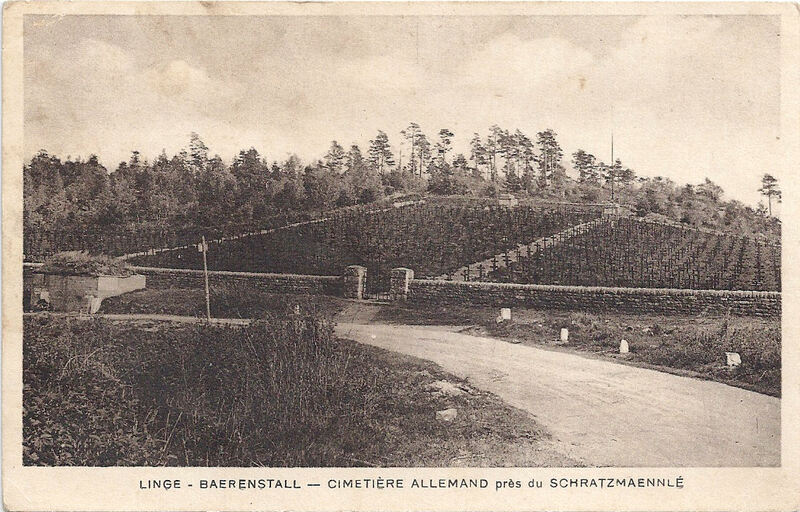 (The stamped card was posted in Wesserling, Alsace, German territory at that time, hence the German stamp.) 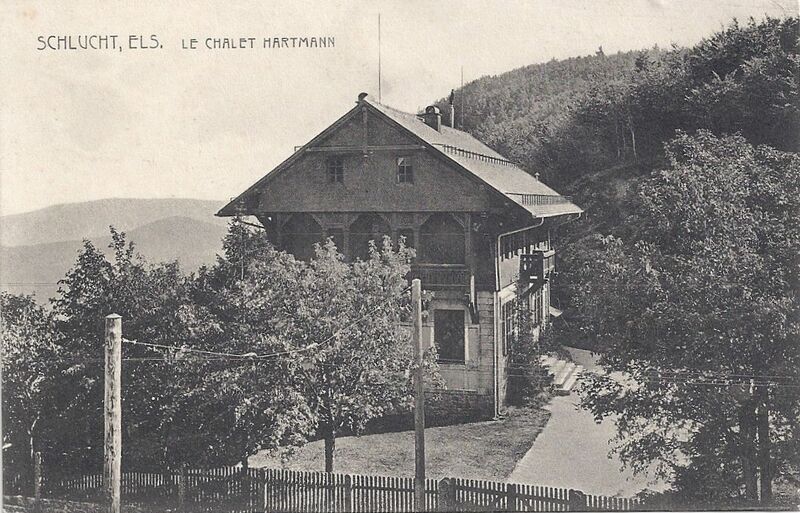 The small chalet nearest the camera was built by Touring-Club. The N66 remains an important road under pressure. 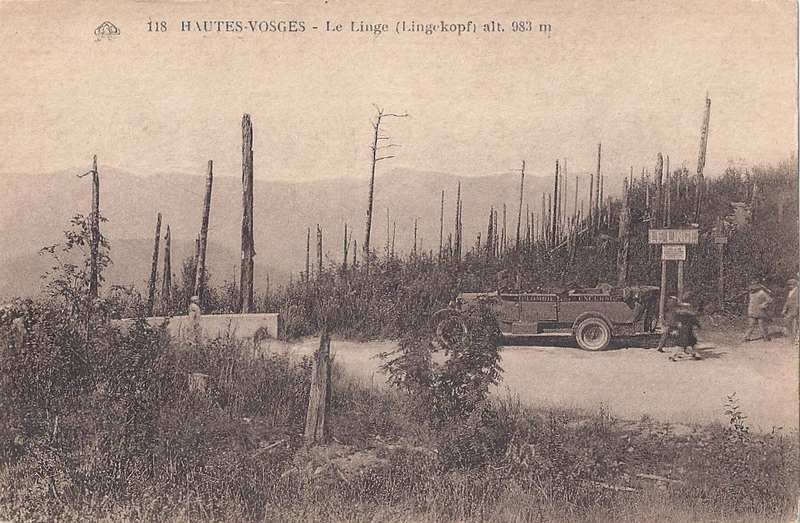 In earlier centuries the route was vital for the defence of France and the movement of troops through the Vosges towards the Swiss border; now trucks are its significant load. 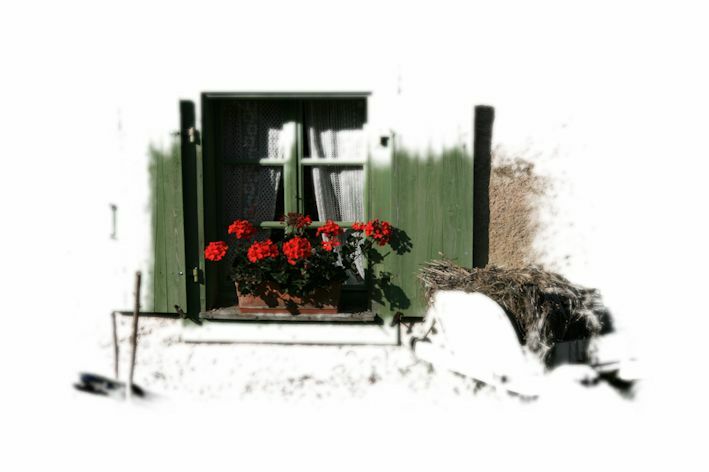 The fast road is worth using briefly for the natural beauty on either side of the Col: from St-Maurice you can pick up the steep route to the Ballon d’Alsace , or it’s pleasant to linger in the tranquil nature reserves and lakes near Urbès and Kruth. 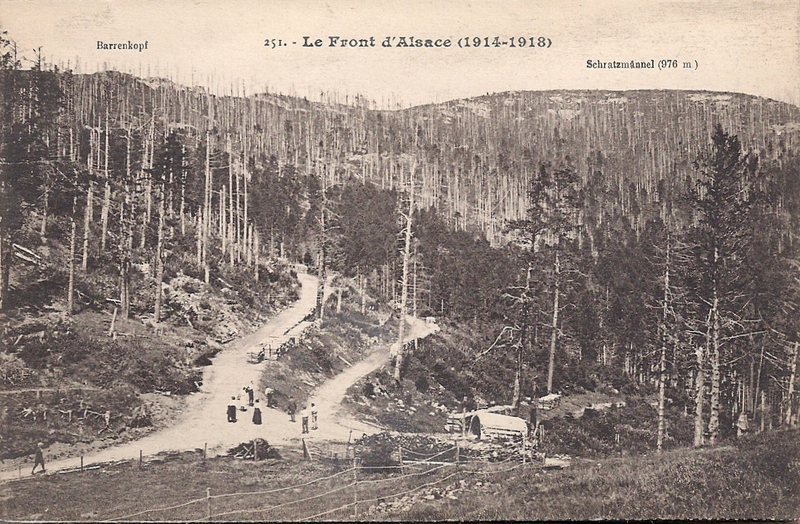 Categories: Administering the frontier before the Great War, Life and leisure, The frontier, The Vosges Cols, Touring and tourism, Vosges | Tags: Alsace, Col de Bussang, Elsass Lothringen, frontière, frontier, hiver Vosges, Reichsland Elsaß Lothringen, Tunnel de Bussang, Vosges, winter Vosges | Permalink. 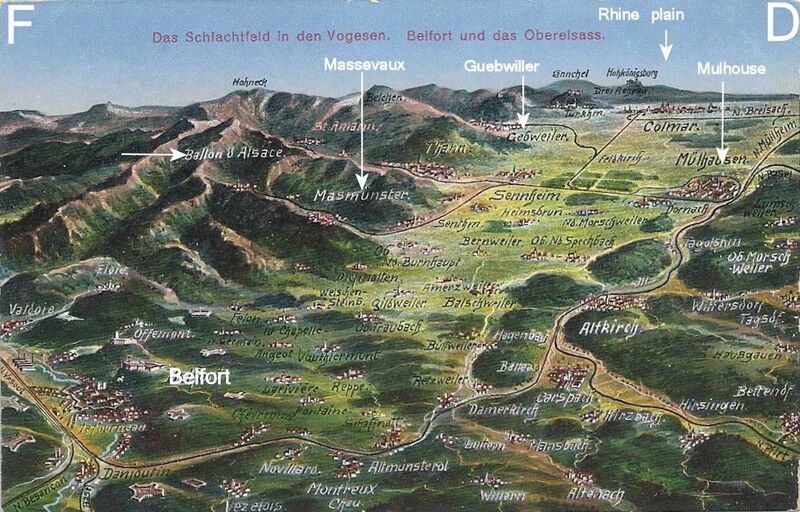 By way of orientation, here’s an annotated “bird’s eye” map showing the Ballon d’Alsace. 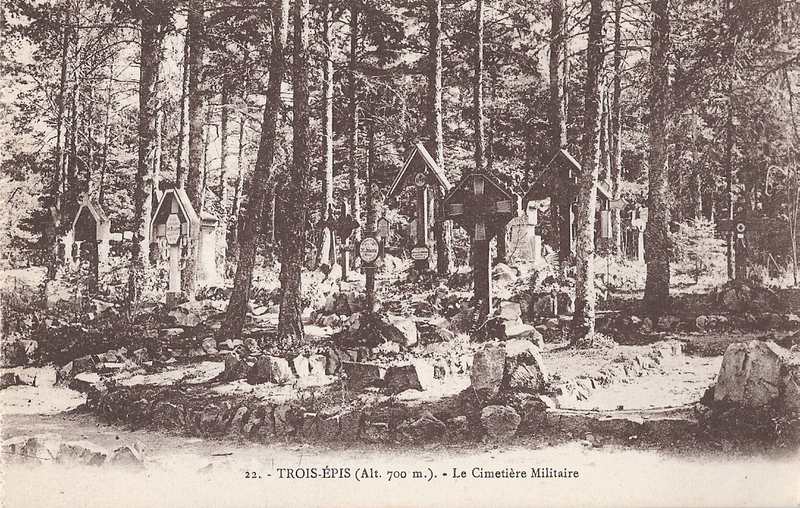 These cards were very popular among soldiers writing home from the Front. Most of mine are German and the place names used are those which replaced the French names during the period of occupation. 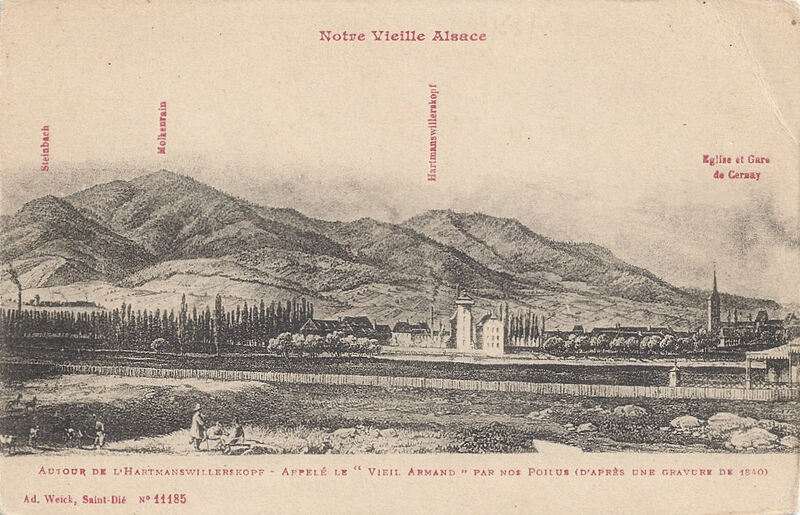 Categories: Maps, Vosges | Tags: Ballon d'Alsace, map, Vosges | Permalink. 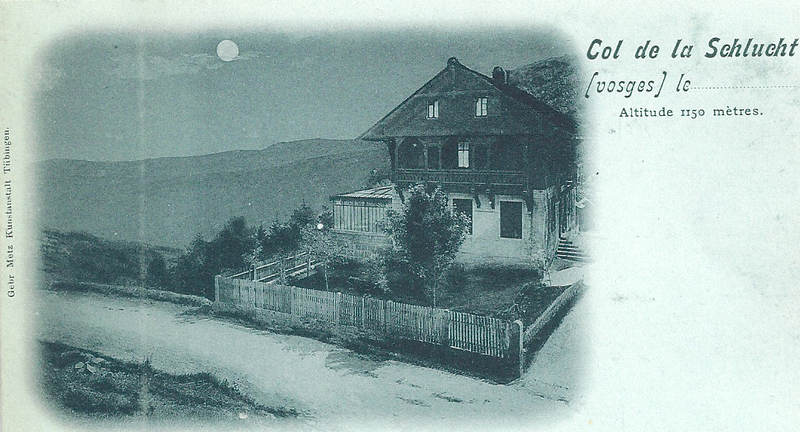 People living in developing industrial areas, in expanding cities such as Strasbourg and in increasingly urban environments viewed the mountains tracing their blue line on the horizon and dreamed of escapes to rural idylls where they could recapture an historic rural lifestyle, breathe fresh air and benefit from outdoor exercise. 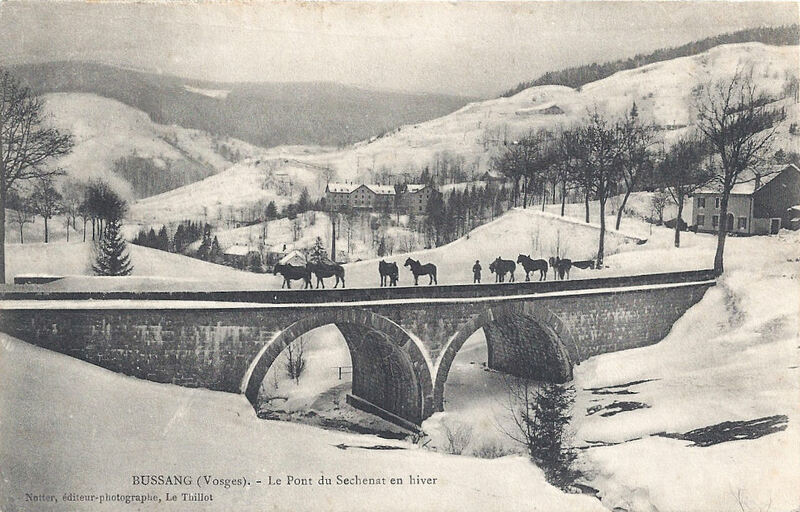 By the early twentieth century, the mountain areas were increasingly accessible and for those in north eastern France or in the territories to the east of the frontier, the Vosges offered beautiful landscapes, snow, space, pure air, a healthy environment and a range of accommodation. 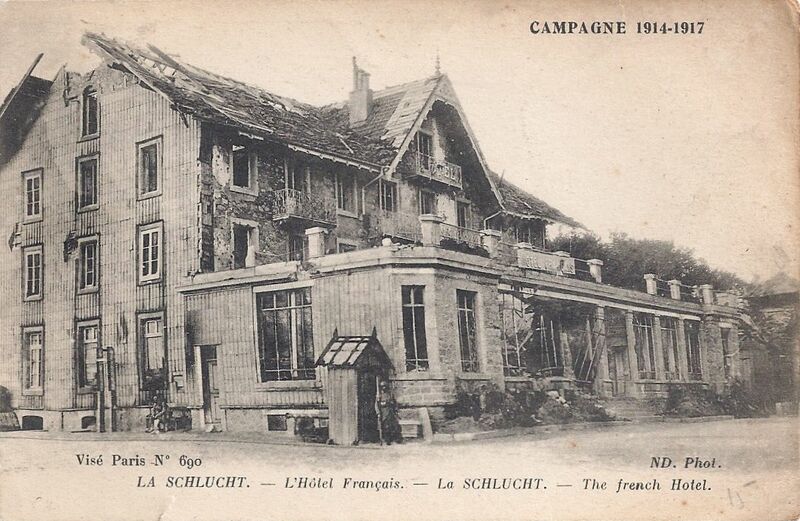 Families could choose between hotels, chalets and small establishments whether they were simply intending to explore the Massif privately or participate in great public events. 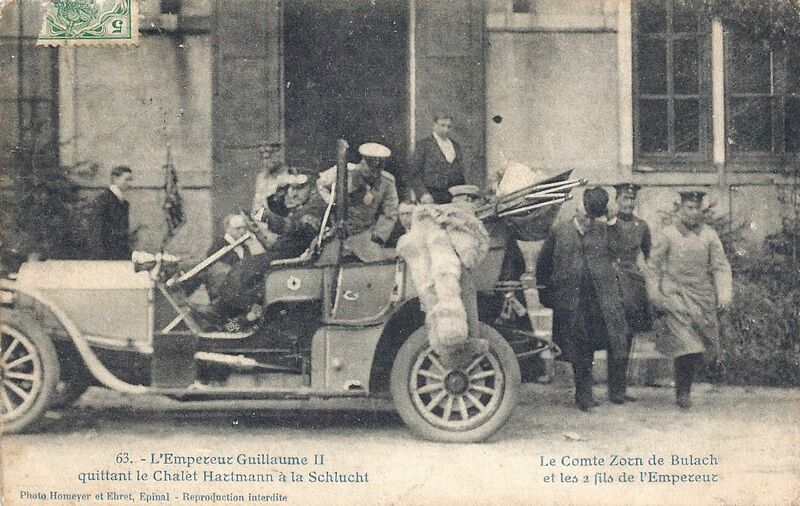 Organisations dedicated to the pleasures and practicalities of visiting the mountains developed and by the time the Great War was on the horizon, these clubs were flourishing. 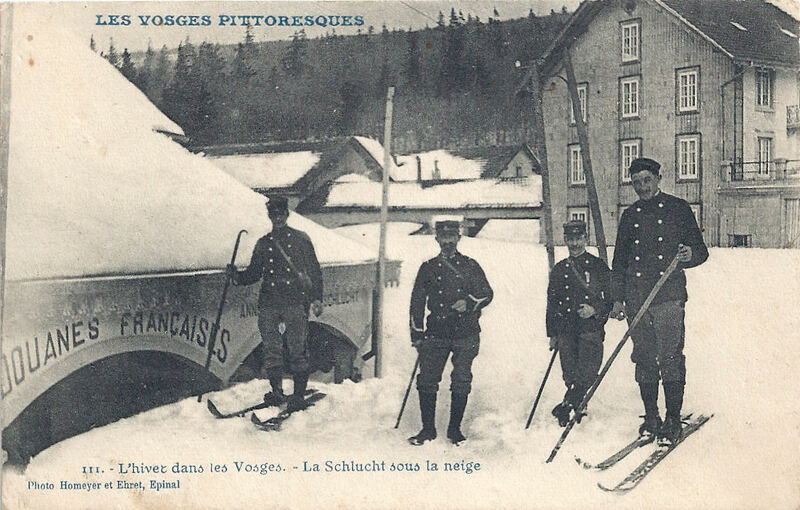 Ski-club Vogesen-Straßburg was launched in 1896 – the German name was used because Strasbourg was in Reichsland Elsaß-Lothringen, the annexed part of France – and in 1902, the defiantly named Les Vosges-Trotters de Colmar was started by French-minded Alsaciens. Some of these clubs were modelled on the winter sports clubs which were already popular in the Black Forest, on the other side of the Rhine. The idea of a rural idyll was partly a myth, but it was a myth enthusiastically fostered by travel organisations and tourist literature. La Compagnie des Chemins de fer de l’Est promoted the Vosges with a vigorous poster campaign. 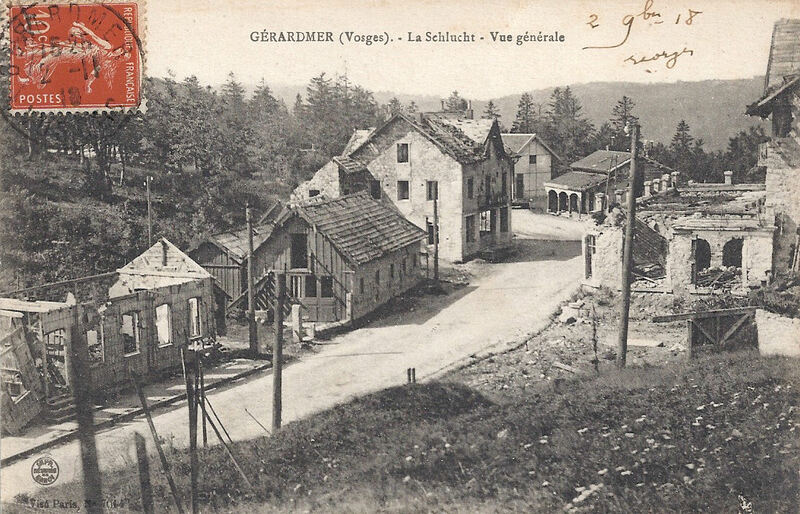 Numerous intrepid travellers published works describing the unspoiled romantic beauty of the Vosges, an area apparently populated by simple honest folk who sang as they went about their daily lives and mingled with innocent animals straight out of fairy tales. The shallow, charming portraits almost entirely ignored the fact that the Vosges is a working area. However, the tourists came. 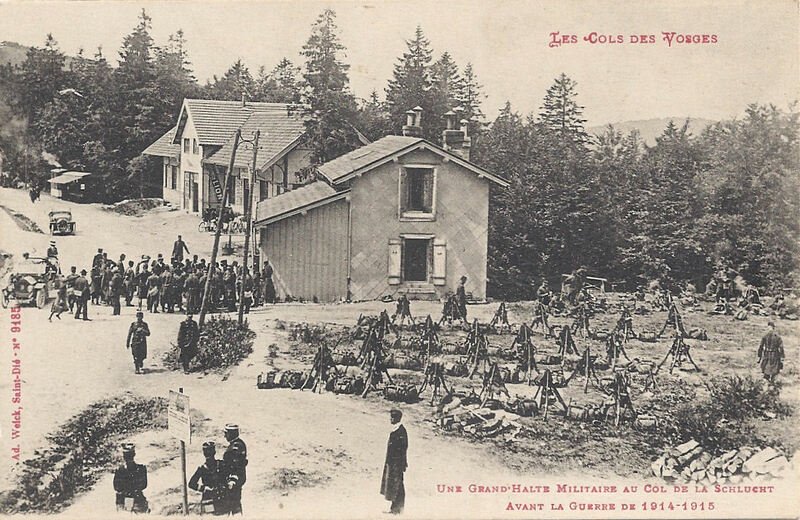 Refuges were built, some by Club Vosgien*, chalets were constructed, farmers saw the opportunity to sell refreshments and their own produce such as cheese. Visitors tended to gravitate towards their nearest mountain heights. 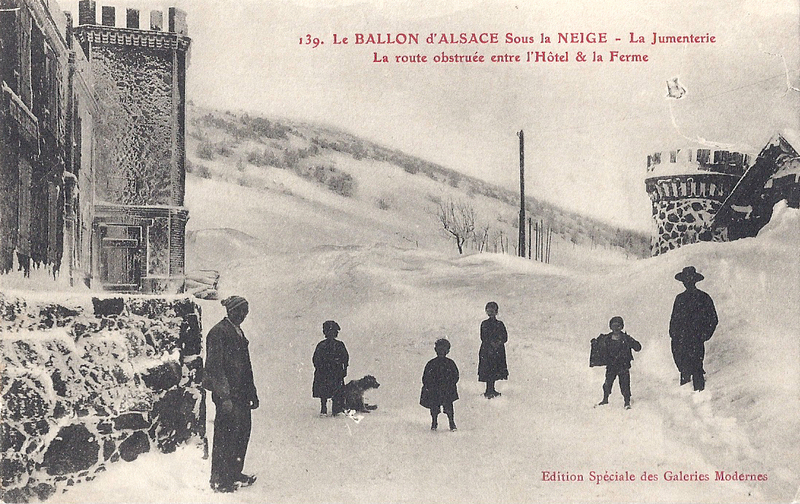 The Ballon d’Alsace drew many visitors from the Belfort region to the south of the Vosges. 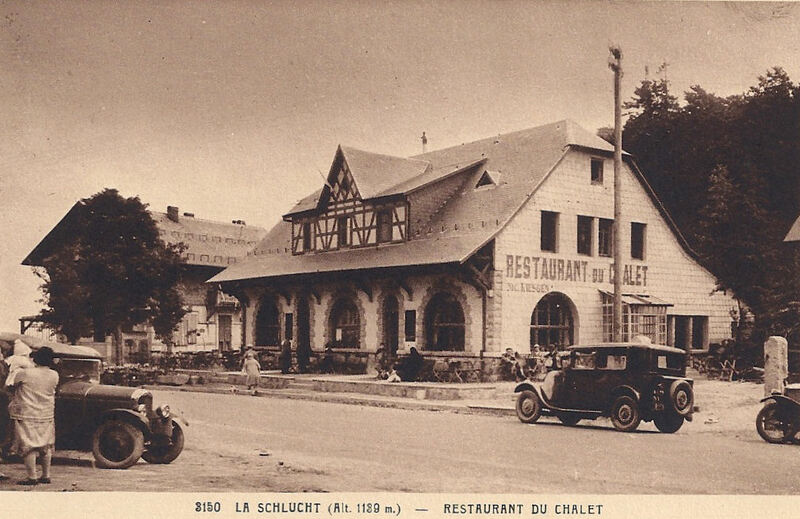 Several hoteliers set up premises at the summit and one particularly original one is the ‘new’ Hôtel de la Jumenterie. It was built on the site of a small farm and its crenelated appearance deliberately evokes an historic past. 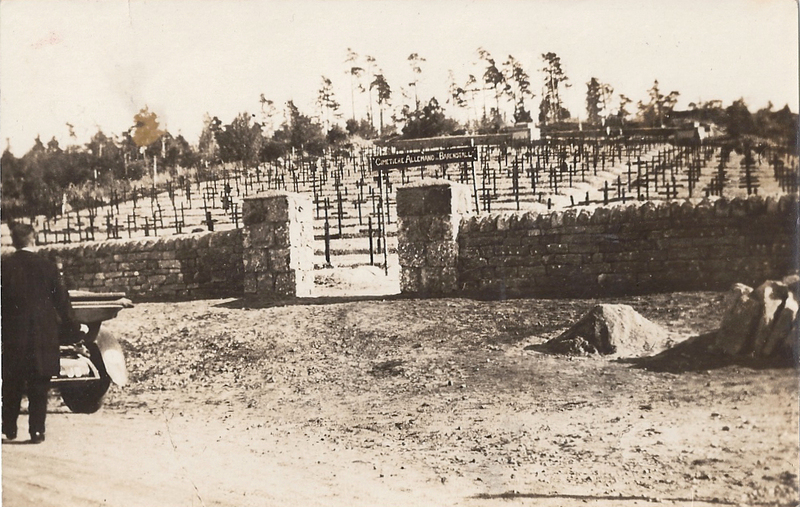 The original jumenterie was a stable for brood mares, established by the Ducs de Lorraine in the 18th century. 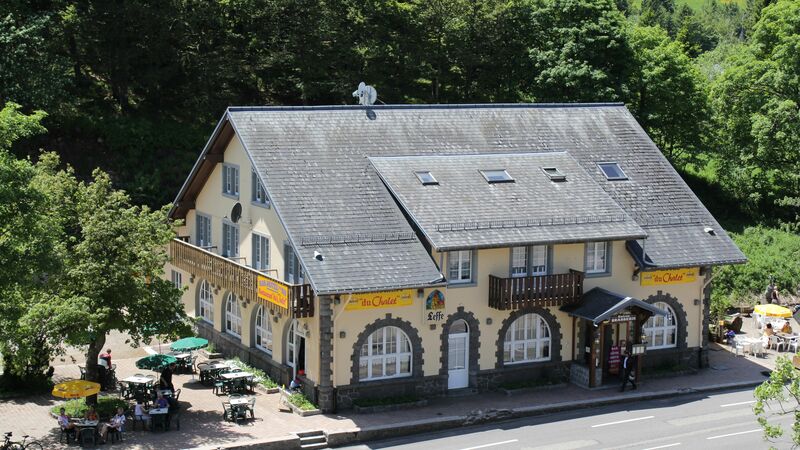 There is still la Jumenterie, now a riding-based holiday centre on the road to St-Maurice, but it does not use the original premises. I’ve been unable to see evidence of these and I think they have been demolished. 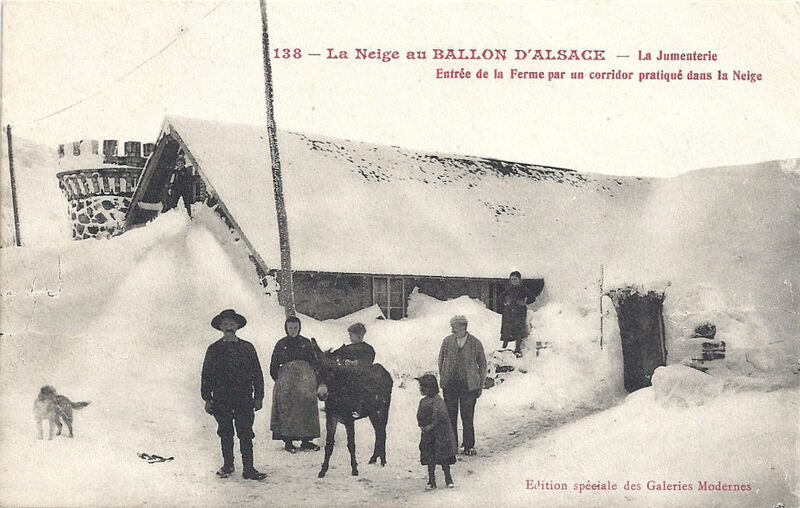 Yet, despite the tourists, the Ballon d’Alsace was still a frontier area, and customs officials still had to pursue their responsibilities, even in the bitterest winter, the deepest snows. 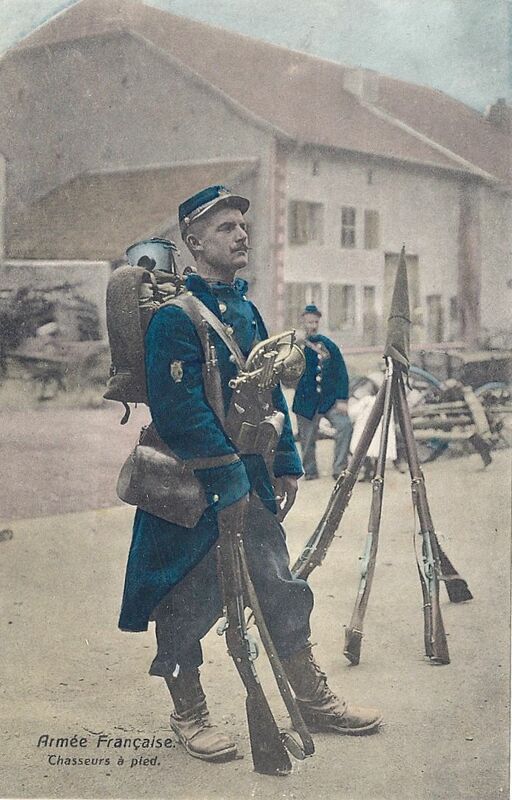 The fun was a temporary mask; the realities could be extremely harsh, as the soldiers serving in the Hautes-Vosges in the Great War would discover in little more than a decade’s time. 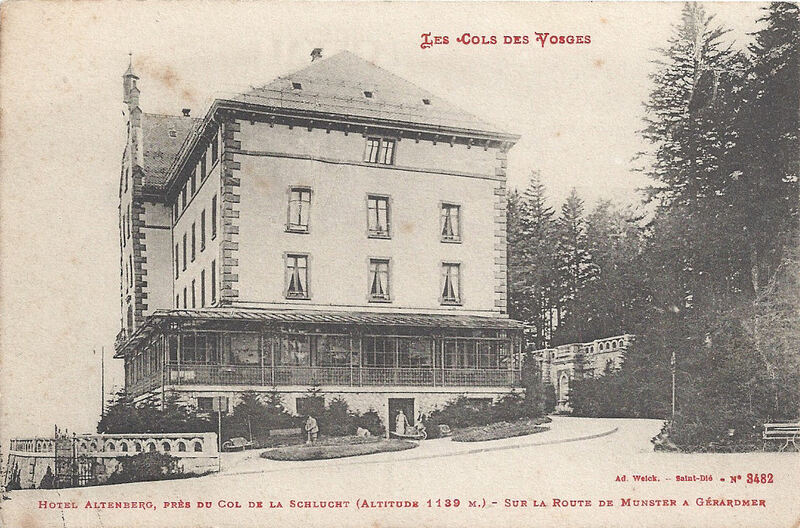 *Club Vosgien, founded 1872, focussed on walkers. 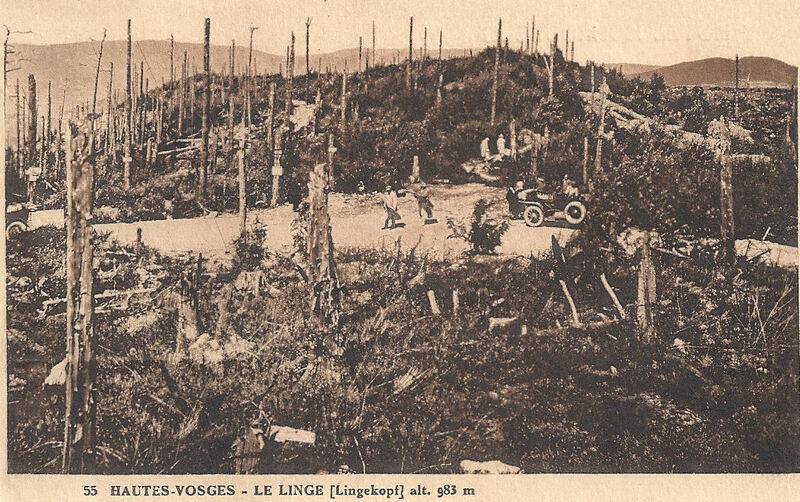 It mapped footpaths and provided excellent sign posts through the whole massif of the Vosges. Today they have covered 17000 km of paths. 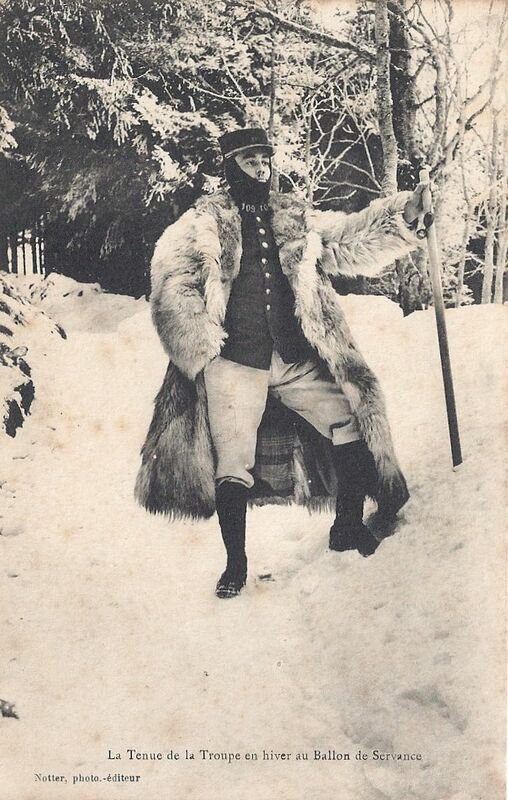 Appealing to the less bourgeois who might not be attracted to the winter sports culture, Les Amis de la nature came to the Vosges just before the Great War, founding branches from 1912-14. 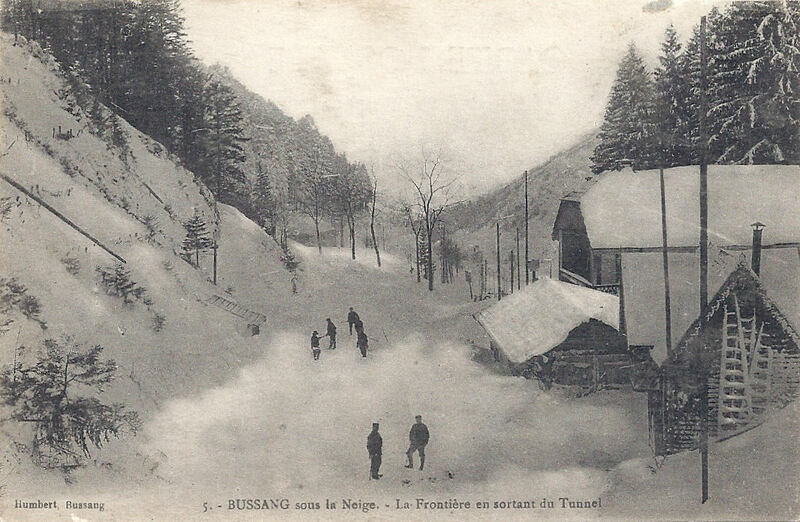 Categories: Administering the frontier before the Great War, Life and leisure, The frontier, Touring and tourism, Vosges | Tags: Alsace, Ballon d'Alsace, frontière, frontier, hiver Vosges, la Jumenterie, Reichsland Elsaß Lothringen, Vosges, winter sports Vosges, winter Vosges | Permalink. 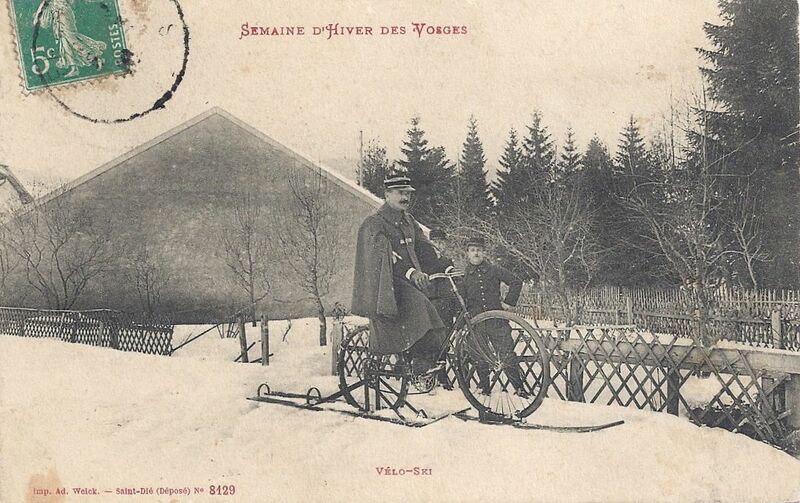 Winter tourism (and some inventive transport) before the Great War: have a fabulous week in the Vosges! Towards the end of the nineteenth century, there was a growing appetite for affordable travel and the bicycle offered a perfect means of economic transport. The Bicycle Touring Club was founded in Britain in 1878, but changed its name five years later to the Cyclists’ Touring Club so that tricycle users could join. 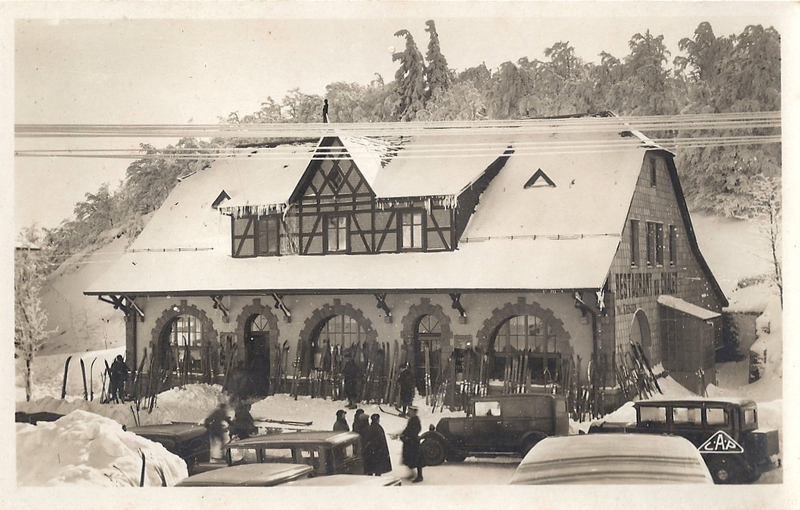 Naturally the Vosges mountains offered plenty of opportunities for the early tourism industry and Touring Club de France organised a series of exhibitions to promote the pleasures of spending a week in winter enjoying snow sports. The intermittent adventures of wealthy individuals with plenty of time could now potentially be enjoyed by more people. 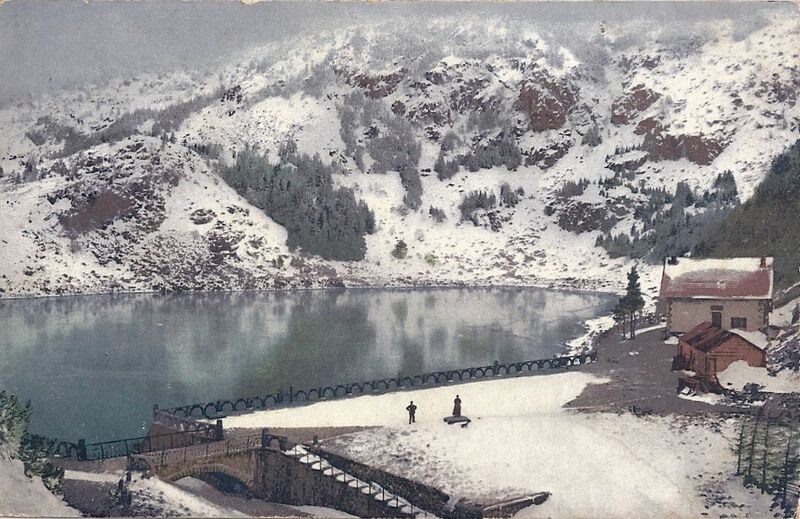 February 1910 was bitterly cold and the heavy snowfall was an auspicious start to the new winter sports tourism industry. 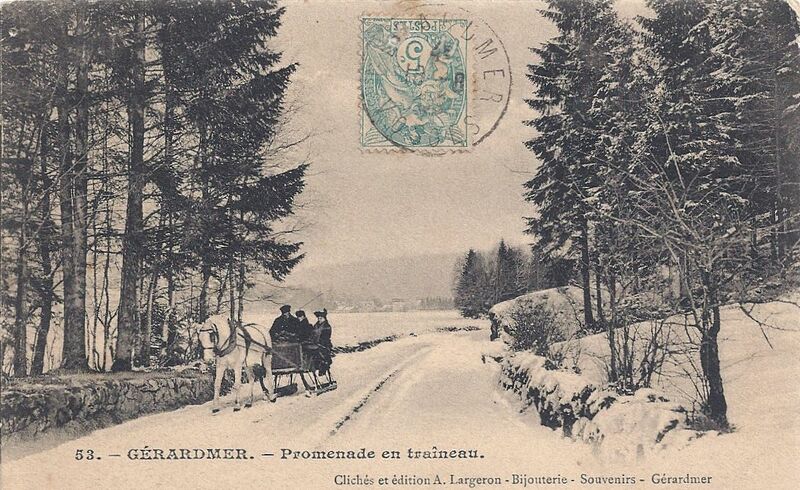 Gérardmer, on the French side of the 1871 frontier in the Hautes-Vosges, was an extremely popular summer destination but moribund in winter. The efforts of Touring Club de France could transform its tourist trade in its quietest season. 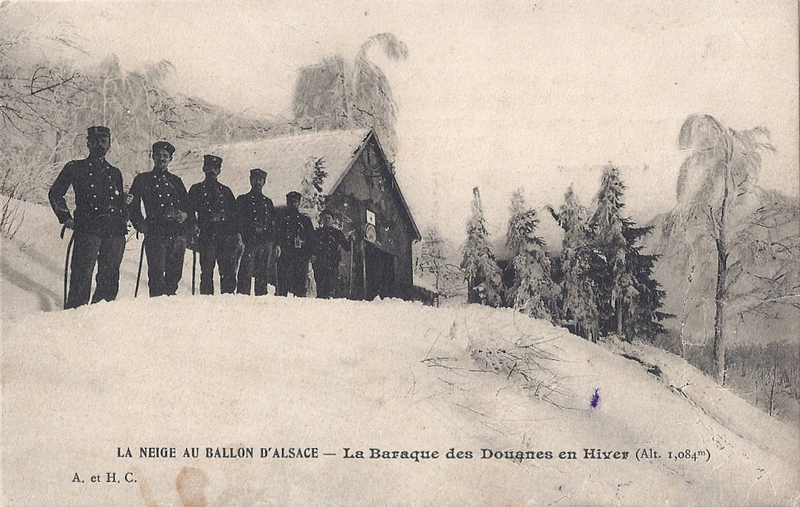 and military skiers on the Ballon d’Alsace. Security is non-existent! The spirit of adventure inevitably led to mishaps. 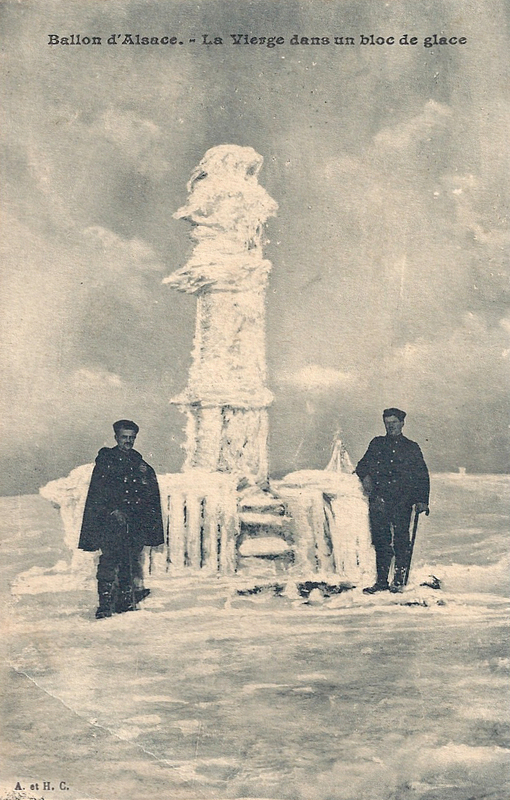 One particular accident near Col de la Schlucht involved two French officers who aspired to reach the summit of Hohneck (1363m), undaunted by the atrocious weather conditions. Inevitably, they were caught in snowfall and fog. Suddenly, one vanished before his companion’s horrified eyes. He had fallen down a ravine, but fortunately his fall was cushioned by snow and he survived, bruised. This didn’t deter others from intrepid escapades and there were deaths. The winter sports season was a great success and hopes were high for the coming years. 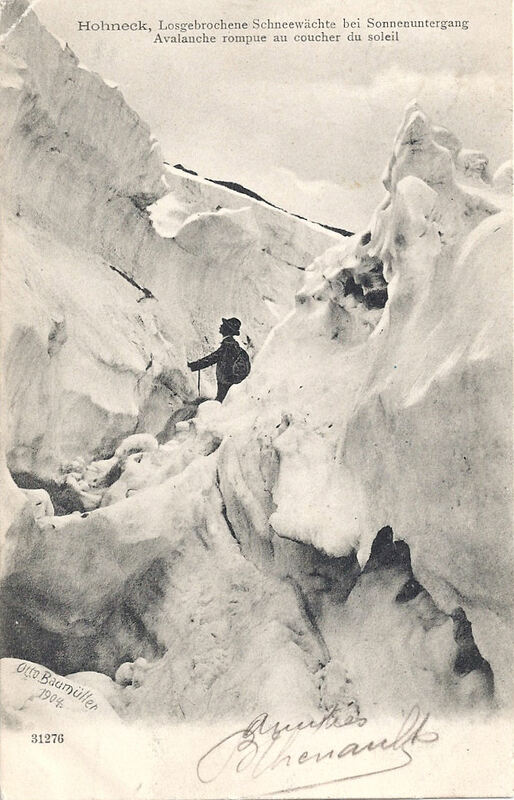 Unfortunately in 1911 the snow failed to materialise. 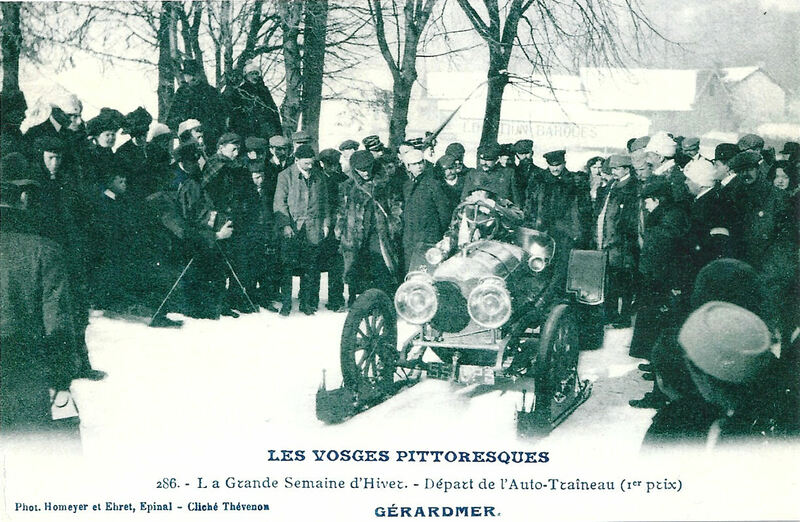 In 1912/3, le Club alpin français held the seventh Concours internationale de Gérardmer, an international snow sports event. 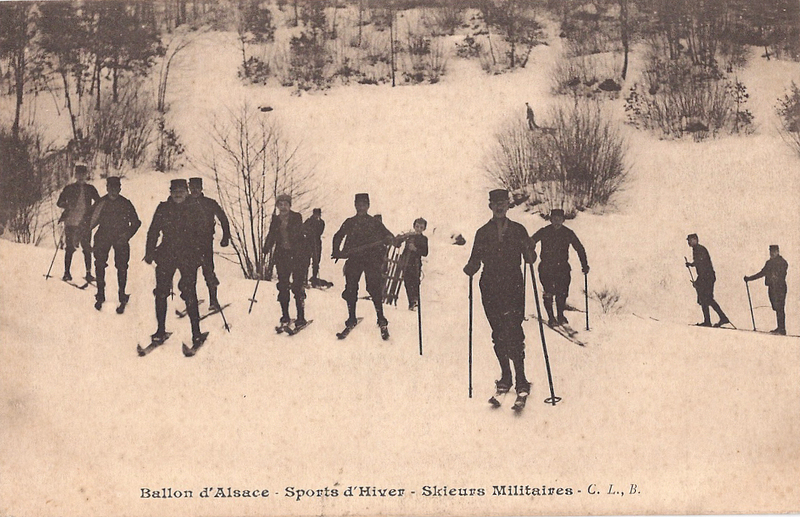 A winter sports programme was organised for January 1914, with skiing and evening skating by electric lighting on constructed ice rinks. 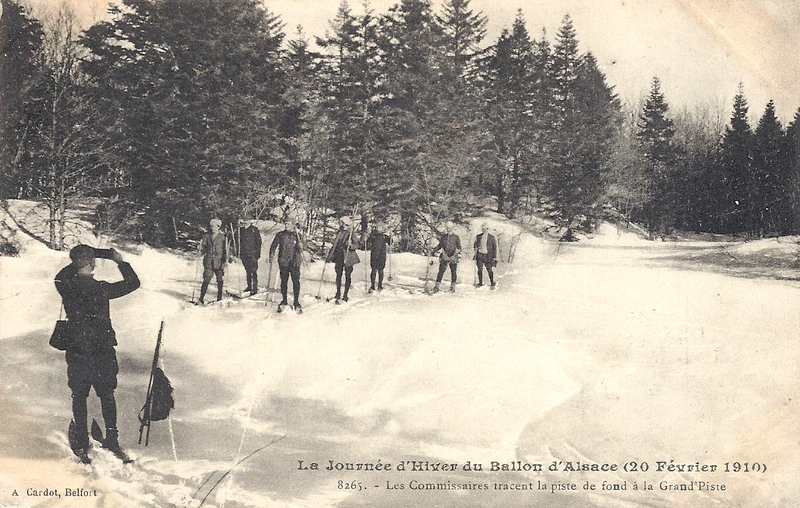 This was the last winter sports season on the French side of the frontier. By the time the Hautes-Vosges were next available for winter pleasure, Alsace and the Vosges had been restored to France. 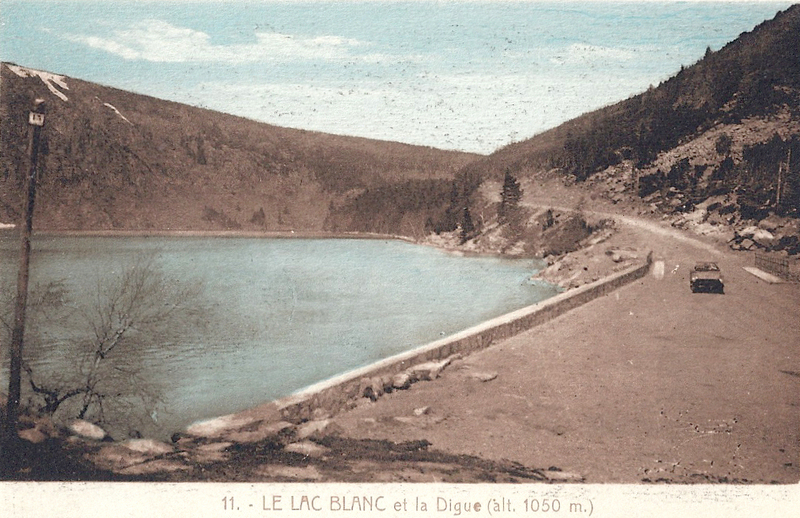 Categories: Life and leisure, Touring and tourism, Vosges | Tags: Alsace, auto-traîneau..., Col de la Schlucht, frontier, hiver Vosges, traîneau à hélice…, vélo-ski…, Vosges | Permalink.